This question will yield a number of different answers depending on whom you ask. Canadian schoolkids fresh from Social Studies class may recall that Italian navigator John Cabot discovered the rocky shores of Labrador in 1496 on behalf of King Henry VII of England. American schoolkids might be just as quick to point out that another Italian navigator, Christopher Columbus, discovered the sandy beaches of Cuba four years earlier on behalf of Queen Isabella I of Castile. Fans of The Curse of Oak Island may pipe up that Portuguese explorer Joao Vaz Corte-Real may have discovered Newfoundland in 1473 on behalf of Alfonso V, King of Portugal. 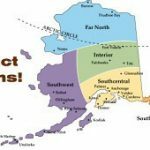 And people of Native American pedigree may remind you that their ancestors emigrated from Siberia up to 14,000 years ago. 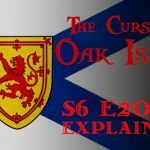 If you ask a member of Canada’s Scandinavian communities, however, such as the residents of Gimli, Manitoba, or New Denmark, New Brunswick, you may hear a tale that was passed down centuries ago by their medieval ancestors- the tale of Viking voyages to Canada which took place more than a thousand years ago. The Norse Vikings were a hardy sea-faring folk from Scandinavia who lived in small kingdoms during the Early Middle Ages. For most of the year, they lived as farmers and fishermen, scraping out as good a living as their harsh northern environment would allow. When summer came, wealthy farmers would leave their lands in the hands of their wives, recruit a company of loyal friends and kinsmen, and set sail in search of fortune and adventure. From the late 700s until the mid-1000s, during what is known as the ‘Viking Age’, Norse raiders sailed up and down the coastlines and rivers of Europe, pillaging and plundering as they went. With lightning speed, they attacked villages, churches, and monasteries, retreating to their longships with any booty they could lay their hands on before their victims had a chance to organize any sort of resistance. 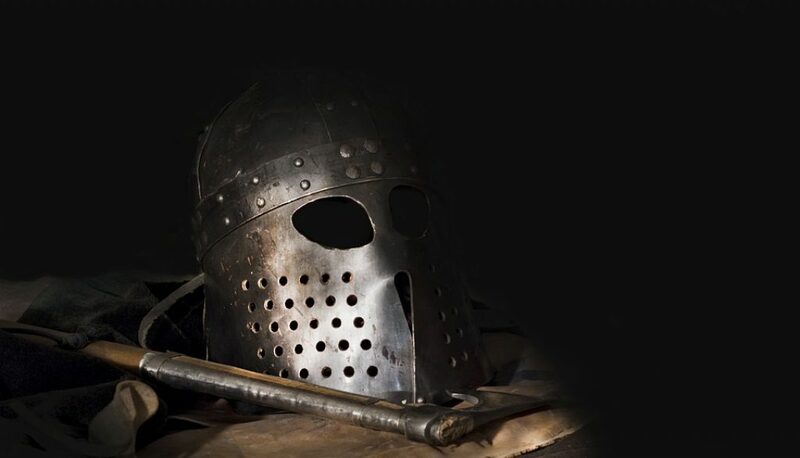 For centuries, the sight of a Viking longship with a carved dragon’s head on its prow and a row of shields lashed to its side struck terror into the hearts of peasants and clergymen from Moscow to Madrid. Over time, the Vikings transitioned from reaving and pillaging to consolidating and colonizing. Many became settlers at the places they had once ravaged. 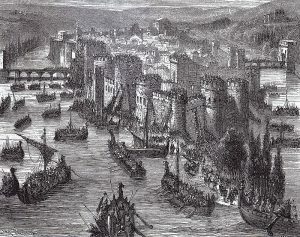 For example, the enormous Norse raider named Rollo, whom some may recognize as a character from the History Channel series Vikings, became the first Duke of Normandy in the year 911; his great-great-great grandson, William the Conqueror, would go on to wrest England from control of the ruling Anglo-Saxon king at the Battle of Hastings (1066). Around the same time, Norse warlord Harald Fairhair united a cluster of petty Viking kingdoms, which had warred with each other for centuries, into a single Kingdom of Norway. Many Viking chieftains who were unable to retain their power in this age of unification chose to sail west in search of new lands. In around 860 A.D., some of these political refugees discovered and settled Iceland. Less than a century later, their descendants would establish the Icelandic Commonwealth, which was governed in part by the Althing, the oldest parliament in the world. In 960 A.D., a Norse Viking named Thorvald Asvaldsson fled from Norway to northwestern Iceland with his family, having been banished for committing manslaughter. His son, a red-bearded farmer called Erik the Red, was similarly banished from Iceland twenty two years later for a comparable crime. Accompanied by a handful of loyal friends and relatives, Erik the Red left his longhouse and headed out to sea, bound for a mysterious land to the west which had been spotted by Icelandic sailors blown off course. Erik the Red and his crew spent three years exploring this new land, and discovered that it had areas which were suitable for farming. In 985, the red-bearded explorer returned to Iceland and regaled his fellow Vikings with tales of what he attractively dubbed “Groenland”, or “Greenland”. Having convinced a number of Norsemen to help him settle this new territory, Erik the Red returned to Greenland that year and established a colony there, which was named Eriksfjord. Erik the Red and his wife eventually had four children: a lucky son named Leif; a brave son named Thorvald; a selfless son named Thorstein; and a cunning daughter named Freydis. Their subsequent discovery of a mysterious land to the west became the stuff of legend. For generations, Scandinavians spoke of their New World adventures around smoky longhouse fires. Medieval storytellers eventually put these tales to parchment, writing what are known as the Icelandic Sagas. There are two sagas which detail the Viking discovery of the New World: The Saga of Erik the Red (written before 1265), and the older Greenland Saga, both of which were written several centuries after the events they purport to chronicle. The events outlined in the sagas are also referenced briefly in 11th Century German chronicler Adam of Bremen’s book Descriptio Insularum Aquilonis (1075), a history of the northern world, as well as in 12th Century Icelandic historian Ari Thorgilsson’s book Islendingabok, or “Book of the Icelanders”. The following are summaries of chapters of the Icelandic sagas which pertain to the Norse discovery of the Americas. Around the time of Erik the Red’s settlement of Greenland, a Norseman named Bjarni Herjolfsson had a tradition of alternately wintering in Norway, the Norse homeland, and in Iceland, where his father, Herjolf, lived. One autumn, Bjarni sailed from Norway to Iceland to discover that his father had emigrated to Erik the Red’s Greenlandic colony. Determined to winter with his father as was his custom, he and his crew sailed west. Bjarni and his men soon encountered storms which blew them off course. When the fog cleared, the Norsemen found themselves within sight of a strange wooded land. Ignoring the entreaties of his curious crewmen, Bjarni refrained from embarking and sailed north. He came within sight of two more strange lands, neither of which he explored, before finally finding his way to Greenland. 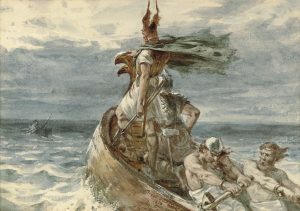 The tale of Bjarni’s discoveries became the talk of the colony, and soon Leif Erikson, Erik the Red’s eldest son, decided to lead an expedition west in search of them. Although the elderly Erik the Red initially agreed, with some reluctance, to accompany his son, an omen convinced him to remain behind. Leif Erikson and his crew sailed west and soon came to a barren, icy land covered with flat stones. He called this place Helluland, or “Flat-stone-land”. 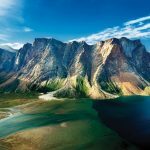 Most historians believe that Helluland was likely the eastern shores of Baffin Island, the largest island in Canada. Finding Helluland to be of little interest, Leif and his crew continued south. Eventually, they came to a rugged land of evergreen woods and white shores. The Vikings called this place Markland, or “Forestland”. Most historians believe that Markland is likely northern Labrador. Leif and his crew continued south, sailing for two days with a wind that blew from the northeast, before coming to a temperate land carpeted with thick dewy grass. The Vikings felt that this would be a good place to spend the winter and set about building houses. That accomplished, Leif sent half his men out to explore this new land. When one of Leif’s friends, a German named Tyrker, failed to return, Leif led a search party to find him. The Norsemen eventually found Tyrker unharmed but babbling excitedly in German. 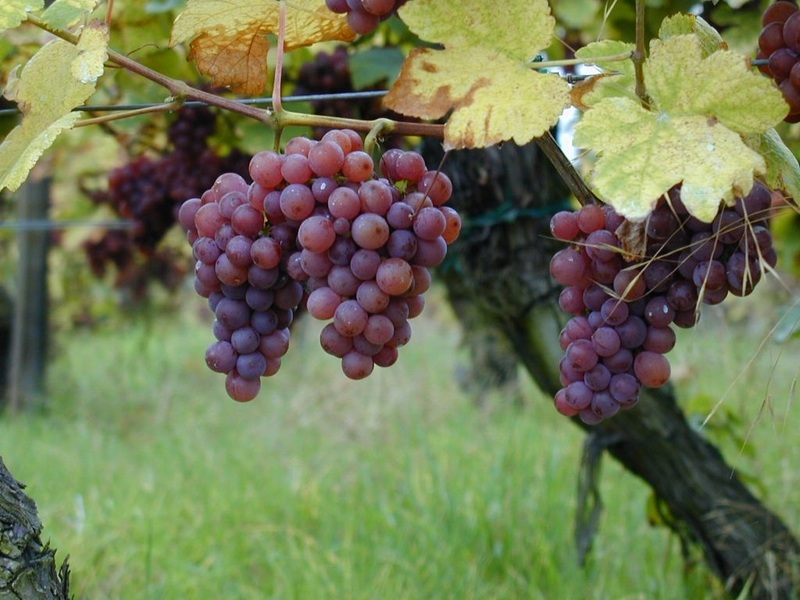 When they finally managed to calm him down, Tyrker informed them, in Norse, that he had discovered grapevines not unlike those from his German homeland. 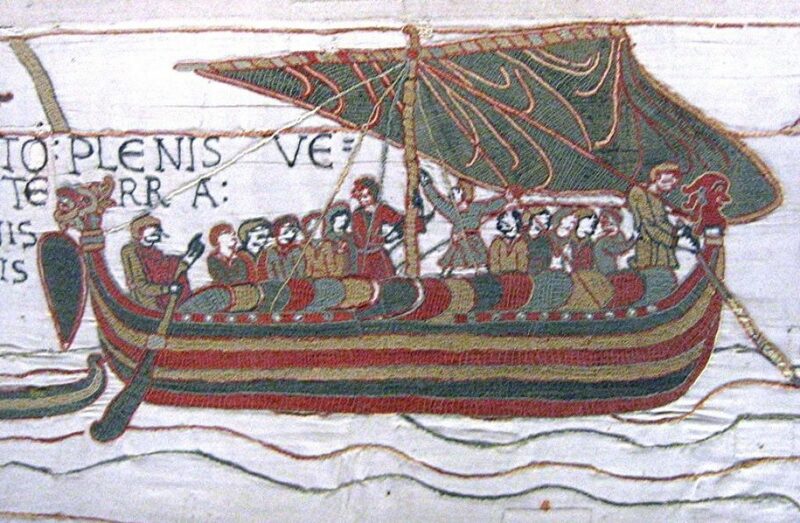 Leif ordered his men to harvest the grapes, which were so plentiful that the Scandinavians were forced to store them in a small boat and tow it behind their main ship. Leif Erikson dubbed this new land Vinland, or “Wineland”, on account of this pleasant discovery. Today, there is some debate among historians over the location of Vinland. 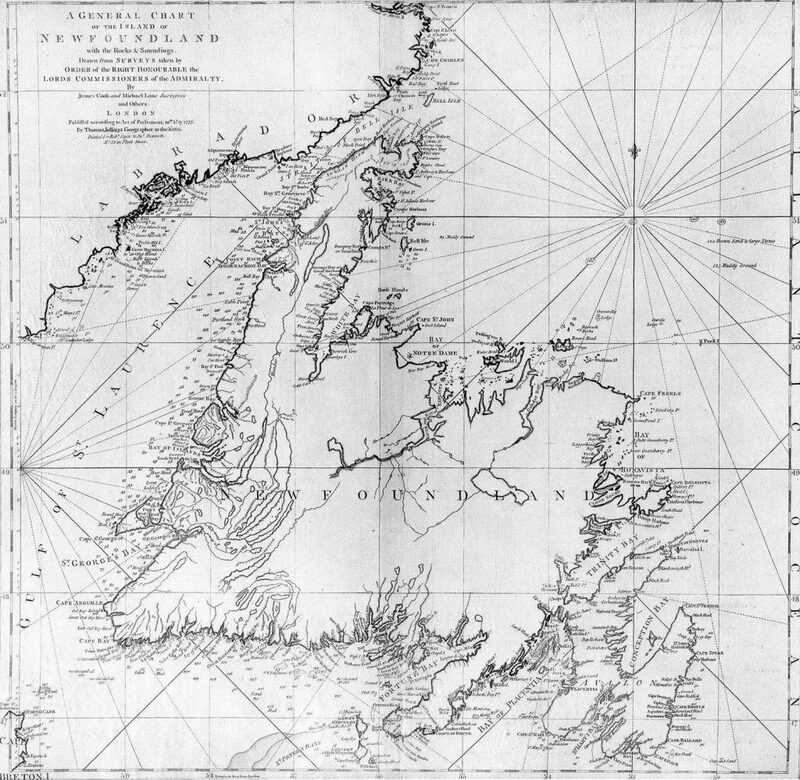 Many believe Vinland to be Newfoundland’s Northern Peninsula, since archaeological evidence recovered there corresponds quite well with the sagas’ descriptions of the colony that the Norse allegedly founded. Others, observing that wild grapes do not grow north of New Brunswick, maintain that Vinland must be located further south. Champions of the former theory counter this argument by suggesting that either Leif and his Vikings mistook gooseberries, which Newfoundland has in abundance, with grapes, or that Leif Erikkson invented the grape story out of whole cloth, giving the land he discovered an attractive name, like his father did upon discovering Greenland, in an attempt to attract colonists. After spending a pleasant winter in Vinland, Leif Erikson and his crew returned to Greenland, their ships filled with grapes and timber. The tales they told of their adventures piqued the curiosity of their fellows, and soon Leif’s brother, Thorvald, decided to see this New World for himself. Setting sail with a crew of thirty men, Thorvald Erikson followed Leif’s route west to Helluland, south down the coast of Markland, to Vinland. The Vikings found the derelict remains of Leif’s camp and, Thorvald having leased these properties from his brother back in Greenland, spent the winter there. In the spring, Thorvald and his men sailed west on an exploratory expedition. They found little sign of human presence and decided to return to Leif’s camp to spend another winter. The following summer, Thorvald and his crew made an exploratory expedition to the northeast. One day, after returning to their ship from an inland trek, the Vikings found three brown lumps on the sand not far from their vessel. They cautiously approached the objects and found that they were upside-down skin boats, beneath each of which slept three strange-looking men. Viking lore being littered with tales of goblins, dwarves, elves, and hostile spirits, Thorvald and his crew were anxious to learn whether the strange inhabitants of this foreign land were flesh-and-blood beings or supernatural entities. They began to murder the natives, and managed to kill eight of them; the last escaped in his boat. Exhausted from the ordeal, Thorvald and his men lay down to sleep. They awakened just in time to see a large party of natives approaching them, brandishing bows and arrows. The Vikings formed a shield wall to defend themselves and allowed the natives, whom they called “Skraelings”, to pelt them with projectiles. When the natives saw that their barrage had little effect on the Northmen, they retreated. When Thorvald determined that none of his men had been wounded in the skirmish, he revealed that he had received a bone-shod arrow in his armpit, it having glanced off the side of the ship to circumvent his shield. Thorvald knew that he was mortally wounded and asked his men to bury him on a particular piece of land jutting into the sea, on which he had hoped to build a house. 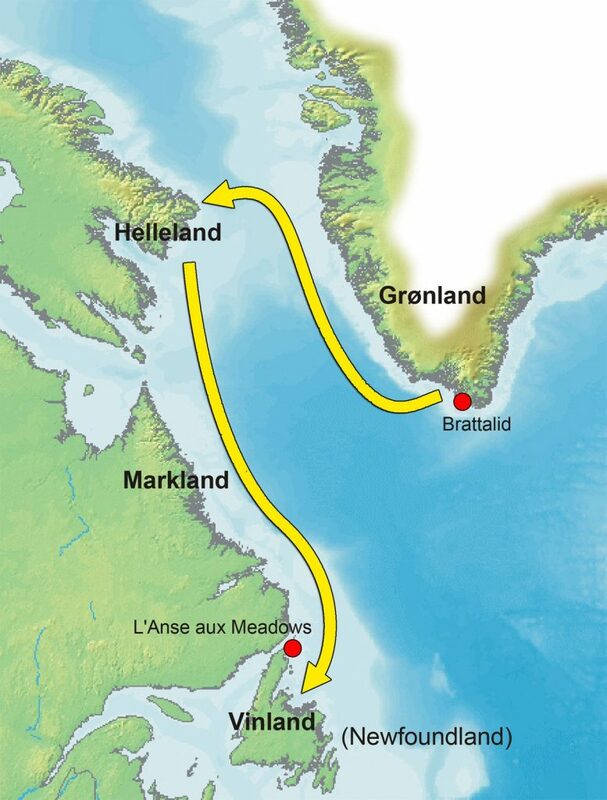 The Norsemen did as their captain requested and returned home to Greenland. When Thorstein Erikson (Erik the Red’s third son) heard of Thorvald’s death, he determined to sail to Vinland to retrieve his brother’s body. With 25 men and his wife, Gudrid, Thorstein appropriated his brother’s ship and set sail for the New World. 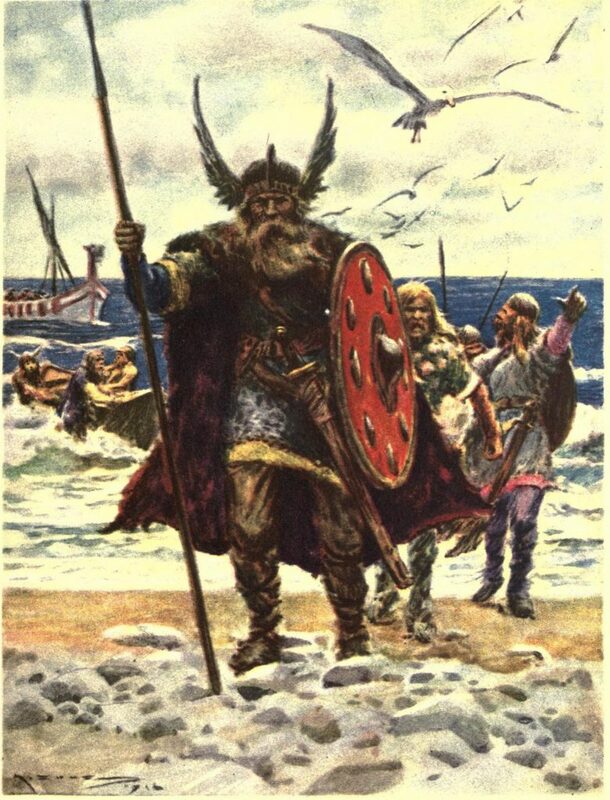 After sailing all summer, Thorstein and his crew were unable to find Vinland. Eventually, they made landfall on a settlement on the western shores of Greenland, not far from where they had first embarked. Winter was nearly upon them, and so Thorstein Erikson secured lodging for all his men. Without any money left for himself, he and Gudrid were forced to sleep on their ship. Fortunately, a local farmer named Thorstein the Black, who lived a lonely life and desired company, approached Thorstein Erikson and invited him and Gudrid to winter with him and his wife, Grimhild. The couple gratefully accepted his hospitality. That winter, a sickness swept through the settlement and killed many of Thorstein Erikson’s men. Thorstein Erikson himself eventually fell ill, along with his host’s heavyset wife, Grimhild. Although both Thorstein and Grimhild had been healthy and robust, they, too, eventually succumbed to the malady. Gudrid was deeply affected by her husband’s passing and kept a gloomy vigil over her Thorstein’s corpse, which her bereaved host had laid out on a bench inside his house. Thorstein the Black, taking pity on the grieving widow, picked her up in his arms and sat her down on his lap on a bench opposite Thorstein Erikson’s body. The Norseman did his best to comfort his guest and promised to accompany her to her Eriksfjord, where Thorstein was to be buried. No sooner had Gudrid thanked Thorstein the Black for his consolation than her late husband sat up on the bench. “Where is Gudrid?” the corpse asked. Astonished and terrified, neither the widow nor widower dared answer. The dead man repeated the question twice. “Should I answer his questions or not?” Gudrid whispered to her host. Thorstein the Black shook his head. “I wish much to tell Gudrid her fortune,” the corpse replied, “in order that she may be the better reconciled to my death, for I have now come to a good resting place.” The dead man proceeded to inform Gudrid that she would marry an Icelander, and that she and her new husband would have many “powerful, distinguished, and excellent, sweet and well-favoured” descendants. She would move to Norway, then to Iceland, and would outlive her husband. She would travel the world, visit Rome, and live out the rest of her days as a nun in an Icelandic convent. When the prophecy was finished, Thorstein Erikson’s corpse fell back onto the bench and lay still. True to his word, Thorstein the Black took Gudrid to Eriksfjord. There, Thorstein Erikson’s body was interred in the graveyard of the local church. After Thorstein Erikson’s ill-fated voyage, Greenlandic Vikings began discussing a potential future voyage to Vinland. Around that time, a Norwegian ship arrived in Greenland’s western shore, captained by Thorfinn Karlsefni, a wealthy Icelander. Thorfinn was hosted by Leif Erikson, who introduced him to his sister-in-law, Gudrid. Thorfinn and Gudrid fell in love, and that winter they married, just as Thorstein Erikson had predicted. When spring came, Thorfinn Karlsefni decided to lead an expedition to Vinland. 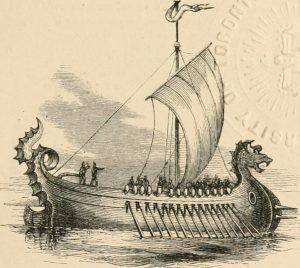 Accompanied by sixty men, five women, and his wife, Gudrid, he sailed past Helluland and Markland to the Vinlandic houses that Leif Erikson had built. Having leased the houses from Leif, Thorfinn and his companions prepared for winter, butchering and processing the carcass of a beached whale that they found nearby. That winter, Thorfinn Karlsefni and his Vikings wanted for nothing, finding plenty of timber, grapes, fish, and game. They also enjoyed fresh milk from a handful of cows that they had brought with them, which were protected against wild animals by a bull they had transported in the hold of their ship. That summer, a band of Skraelings approached the pasture where the Norsemen kept their cattle. 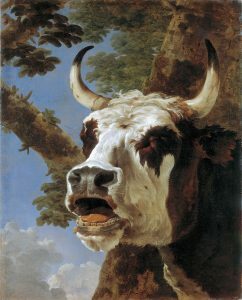 The bull began to bellow at the newcomers, and the natives, having never seen such an animal before, retreated in fear. The Skraelings then proceeded to Thorfinn’s farm. Forewarned of their coming, the Vikings barricade themselves inside the farmhouse. It soon became evident that the natives had come to trade, not to make war. 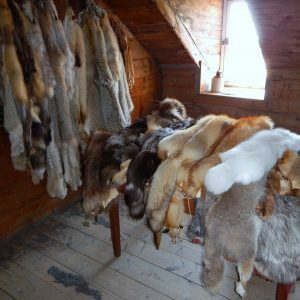 The Vikings eventually emerged from the farmhouse and began to inspect the fine animal pelts the Skraelings had brought with them for barter. The natives indicated that they would like to exchange their pelts for the Vikings’ swords and axes. Loathe to equip the Skraeling with steel weapons, however, Thorfinn instead had the women bring out milk and cheese. After sampling these exotic foods and finding them to their liking, the Skraelings happily exchanged their furs for dairy products and left contented. Once the Skraelings were gone, Thorfinn had the Vikings build a palisade around his longhouse. While the work commenced, Gudrid gave birth to a boy, whom she and Thorfinn named Snorri. And thus Snorri Thorfinnson became the first white child to be born in the Americas. That winter, the Vikings were visited again by a much larger force of Skraelings. Again, the natives appeared intent on trading, and threw bales of furs over the palisade. During the exchange, one of the natives reached for a Viking weapon. Startled, one of Thorfinn’s men slew him. A panic ensued, and the natives retreated. Thorfinn knew that the Skraelings would return to revenge their fallen comrade. Recalling the effect that the bull had made on them, he decided to unleash the animal in order to scare them off. When the natives arrived as anticipated, Thorfinn irritated the bull and allowed it to charge at unsuspecting natives. His plan worked, and the Skraelings retreated. He and his Norsemen killed many of the natives in the ensuing route. The natives never returned to the Viking village that winter, and when spring came, Thorfinn and his company sailed back to Greenland with lumber, grapes, whale oil, and furs. When the Norsemen of Greenland saw the rich haul that Thorfinn Karlsefni had brought from the New World, many began to consider making another expedition to Vinland. Two such men were brothers Helgi and Finnbogi- Icelanders who had arrived in Greenland that summer. Another Northerner with her sights set on Vinland was Freydis, the only daughter of Erik the Red. That winter, Freydis payed a visited to Helgi and Finnbogi and suggested that they sail to Vinland together and split any profits they managed to acquire there. The brothers agreed to her proposal. It was arranged that Freydis and the brothers would each bring thirty fighting men with them to the New World, in addition to their women, so that neither party would have an advantage over the other. Freydis duplicitously broke this agreement by hiding five additional men on her own ship. Helgi and Finnbogi were unaware of her deceit until they reached Vinland. 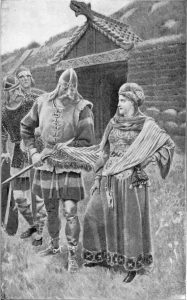 After a brief dispute, it was agreed that Freydis and her party would use the longhouses that Leif Erikson built, and that the brothers and their men would build their own dwelling. No sooner had Helgi and Finnbogi constructed their longhouse than winter came. In order to pass the time, they invited Freydis’ crew to play sports with them. 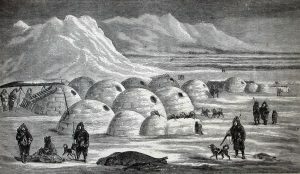 Disputes between the players quickly sowed discord which resulted in both camps spending the rest of the winter alone, in their respective longhouses. One morning, Freydis rose from her furs, slipped on her sark and smokkr (shirt and skirt), and slipped out the door without bothering to put on shoes or stockings. Wearing her husband’s cloak, she walked over to the brothers’ longhouse, found the door ajar, and stood in the threshold. Finnbogi, the only man awake at that time, noticed Freydis in the doorway and asked what she was doing there. “I wish that thou wouldst get up and go out with me,” she replied, “for I will speak with thee.” Finnbogi did as Freydis requested and went outside to sit with her on a tree that the brothers had felled. “How art thou satisfied here?” Freydis asked. Finnbogi replied that he enjoyed Vinland and its abundance resources, but admitted that he did not like the discord that had sprung up between their two camps, and thought that there was no reason for it. 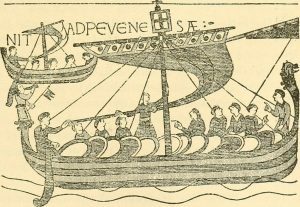 Freydis agreed before stating that the purpose of her visit was to trade ships with the brothers, as theirs was bigger than hers, and she wished to return to Greenland. Finnbogi agreed to her proposal. With that, the two concluded their meeting. Freydis returned to her longhouse and slipped into bed. Her frozen feet awoke her husband, Thorvard, who asked why she was so cold and wet. With a bitter sob, Freydis falsely claimed that she had visited the brothers in order to ask them about exchanging ships, only to be beaten and used shamefully. “But thou, miserable man,” she snarled with reproach, “wilt surely neither avenge my disgrace nor thine own.” She then threatened to leave Thorvard once they arrived in Greenland if he failed to avenge her. Thorvard, none the wiser, threw off his furs in a rage. He roused his kinsmen and led them to Helgi and Finnbogi’s longhouse, where the brothers and their men were asleep. Thorvard’s Norsemen bound each of their hapless countrymen and led them out of the house, where Freydis had each of them executed. At the end of the massacre, only five women remained from the brothers’ camp, whom none of the men would consent to kill. 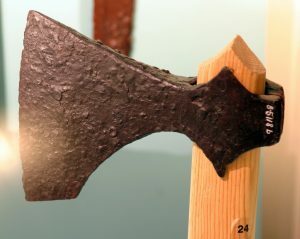 “Give me an axe!” cried Freydis, seizing a weapon from one of her husband’s men. The furious Norsewoman proceeded to hack each of her female compatriots to death. When the slaughter was complete, Freydis rounded on her husband’s crew and threatened to kill any of them who spoke of the bloodbath upon their return to Greenland. If asked what became of the brothers and their crew, they were to answer that they remained behind in Vinland. When spring came, the Scandinavians loaded the brothers’ ship with everything they had acquired that year and put to sea. The homeward voyage was an uneventful one, and the Vikings arrived at Eriksfjord in early summer. In spite of Freydis’ threat, word of the Vinland massacre began to circulate throughout the colony. Incensed, Leif Erikson captured three of Freydis’ men and tortured them until they confessed the whole bloody business. 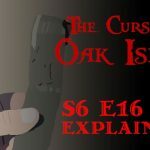 Although Leif suggested that his sister deserved the same treatment, he decided to leave her be, believing that the curse that would hang over her posterity, which her wicked deeds had surely incurred, would be punishment enough. The Saga of Erik the Red paints a very different picture of the Viking discovery of the Americas than that outlined in the Greenland Saga, although there is also much overlap between the two. Instead of Bjarni Herjolfsson, the Saga of Eric the Red contends that Leif Erikson was the first Norseman to see the shores of the New World. When he was a young man, the saga goes, Leif left Greenland, the place of his birth, and travelled to Norway, his father’s homeland. There, he found his way into the service of Olaf Tryggvason, King of Norway. Back in Greenland, Leif Erikson began to evangelize his fellow Norsemen. Many of the colonists, including Leif’s mother, converted to Christianity. Leif’s father, Erik the Red, was one of the few who refused to convert, staunchly adhering to the Norse paganism of his ancestors. Although Erik the Red had little use for the new religion that his son brought to Greenland, he did take a keen interest in the bountiful land that Leif had discovered. He set out with twenty men to find it, but encountered a storm which blew his ship east nearly to Ireland. “They were out at sea two half-days. Then they came to land, and rowed along it in boats, and explored it, and found there flat stones, many and so great that two men might well lie on them stretched on their backs with heel to heel. Polar foxes were there in abundance. This land they called ‘Helluland’. Finally, the Viking explorers came to a pleasant cape where the coast was veined with creeks. As sailing was perilous along that stretch of coast, they sent two scouts to head south on foot to see what could be found. The men returned saying that there were two good lands further south. One was choked with wild grapes, while the other was rich with wild wheat. The Vikings then sailed south down the coast and up a strait, at the mouth of which lay an island encircled by strong currents. According to the saga, “There were so many birds on [the island] that it was scarcely possible to put one’s feet down for the eggs”. The Norsemen continued up the firth, lowered their anchor, and prepared their camp. After spending a hungry winter in the camp, near which there were mountains and large pastures, the expedition split up. One party attempted to return to Greenland but was blown off course; the Norsemen ended up in Ireland. 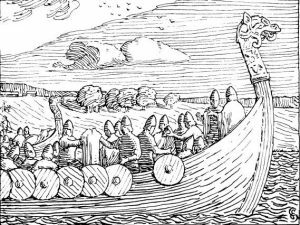 The other group, led by Thorfinn Karlsefni, travelled south. After some time, they came to river which emptied into a lake, which, in turn, drained into the sea. The land near the river’s mouth, which was dotted with large islands, was abundant in wild wheat, while its heights were choked with wild grapes. The river itself teemed with fish, and the woods were abundant with all variety of wild animals. Thorfinn and his company camped in the area for about half a month, spending their time hunting and fishing and playing games. Thorfinn and his companion, Snorri (his son’s namesake), speculated as to the meaning of this strange activity. 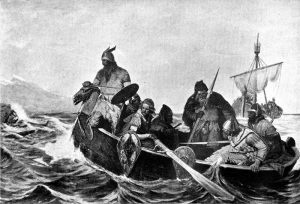 “It may be that it is a token of peace,” Snorri suggested, before proposing that they approach the canoeists with a white shield- a Viking token of peace. The Norsemen followed Snorri’s suggestion and cautiously approached the shore with their white shield held high. The canoeists, in turn, began to paddle towards the shore. “They were short men,” the saga goes, “ill-looking, with their hair in disorderly fashion on their heads. They were large-eyed and had broad cheeks. They stayed there a while in astonishment. Afterward, they rowed away to the south, off the headland”. The Northmen spent the winter near the mouth of the river, during which they saw neither snow nor any more of the mysterious natives, whom they called Skraelings. The natives proceeded to trade grey furs for red cloth. They also wished to purchase swords and lances, but Thorfinn and Snorri forbade their countrymen from selling the natives steel weapons. While the trading ensued, a bull that belonged to Thorfinn Karlsefni rushed out of the woods and bellowed loudly. The Skraelings became frightened and rowed south in their canoes. “Karlsefni and Snorri saw the Skraelingjar were bringing up poles with a very large ball attached to each, comparable in size to a sheep’s stomach, dark in color. These flew over Karlsefni’s company towards the land, and when they came down they struck the ground with a hideous noise. This produced great terror in Karlsefni and his company, so that their only impulse was to retreat up the country along the river, because it seemed as if crowds of Skraelingjar were driving at them from all sides. And they did not stop until they came to some crags. There, they offered them stern resistance. “Freydis came out and saw how they were retreating. She called out, ‘Why do you run away from such worthless creatures, stout men that you are, when, as seems to me likely, you might slaughter them like so many cattle? Let me have a weapon. I think I could fight better than any of you. “They gave no heed to what she said. Freydis tried to accompany them, but soon lagged behind because she was not well. She went after them into the wood and the Sraelingjar directed their pursuit after her. She came upon a dead man, Thorbrand, Snorri’s son, with a flat stone fixed in his head. His sword lay beside him, so she took it up and prepared to defend herself. Although the land was bountiful, the Vikings decided that the Skraeling were too numerous to allow for any permanent settlement and headed north. A hundred of them, Freydis and Bjarni included, decided to remain at the strait at which they had previously camped, while the remainder explored more of the region. 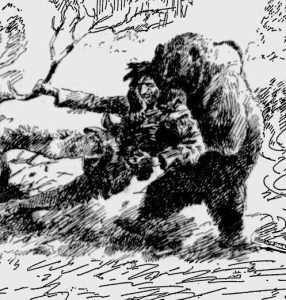 The saga then tells us that, while exploring a river north of Vinland, Thorfinn Karlsefni and his crew encountered a “One-Footer” (also known as a “monopod” or a “sciapod”), a mythological one-legged dwarf which hopped from place to place. The monster shot Thorvald Erikson in the lower abdomen with an arrow. The Viking pulled the projectile out of his gut and remarked that Vinland must be bountiful indeed, as he had grown such a belly that winter that the arrow had failed to harm him. The One-Footer then hopped away to the north. After briefly visiting the land of the One-Footers, Thorfinn and his crew returned to the camp at the strait. That fall, Thorfinn and Gudrid had their first son, Snorri. 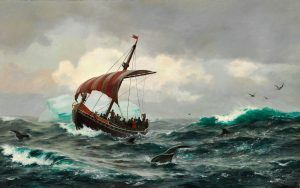 In 1960, a 60-year-old Norwegian trapper named Helge Ingstad, along with his wife Anne Stine, set out to prove once and for all that the Viking sagas were true, and that the Norse really had explored and briefly colonized the Americas in the Middle Ages. 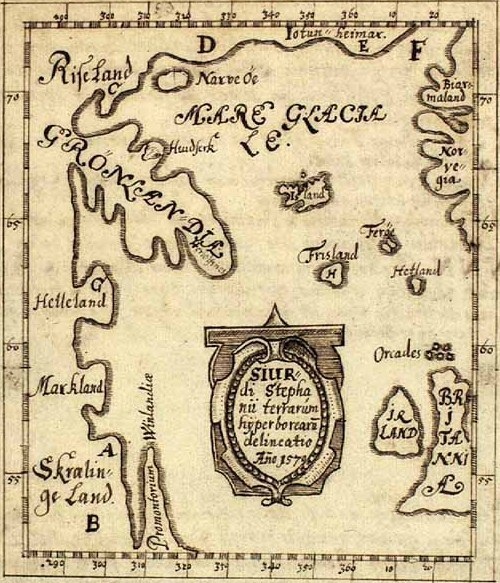 Aided by a copy of the Skalholt map, a 16th Century Icelandic document which alleged to show the relative locations of Helluland, Markland, and Vinland, they began traveling around the rugged coast of Newfoundland, examining different areas and interviewing the locals. There, near the town of L’Anse aux Meadows, Helge and Anne met a grizzled old fisherman named George Decker. 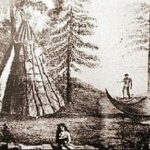 Decker led the couple to an assortment of grassy mounds, which locals had long assumed were the remains of some old Beothuk or Mi’kmaq camp. Helge and Anne Ingstad proceeded to excavate the mounds. What they found changed North American history forever. Helge and Anne unearthed a number of interesting artifacts beneath the mounds at L’Anse aux Meadows, including a soapstone spindle whorl, iron nails, and charcoal which they carbon dated to around 1000 A.D. The most interesting find, however, was a Viking brooch which proved almost without a doubt that the area was once a Norse settlement. Today, archaeologists believe that the ruins at L’Anse aux Meadows once consisted of eight buildings, three of them longhouses capable of housing around eighty people. Near the residential halls was a smithy where nails were made. Some believe that the Viking settlement at L’Anse aux Meadows is none other than Leif Erikson’s Vinlandic colony. Others, noting that Newfoundland is devoid of wild grapes, believe Vinland to be further south, and suggest that the settlement at the tip of Newfoundland’s Great Northern Peninsula served as a stopping point, perhaps being the burial place of Thorvald Erikson or one of the camps referred to in the sagas. Although we may never know the true location of Vinland, we do know without a doubt that long before John Cabot, Christopher Columbus, or even Joao Vaz Corte-Real stepped foot on American shores, Canada was a colony of the Vikings. Although I’ve personally never heard anyone use the term in real-life conversation, every once in a while, I’ll hear the name “Uncle Tom” while watching American news. This name is employed as a derogatory epithet, usually by left-leaning political pundits, against African-Americans whom they perceive to be traitors to their race. The ‘Uncle Tom’ slur derives from the titular character of distorted theatrical and cinematic renditions of Uncle Tom’s Cabin, a famous 19th Century American novel intended to illustrate the evils of slavery. 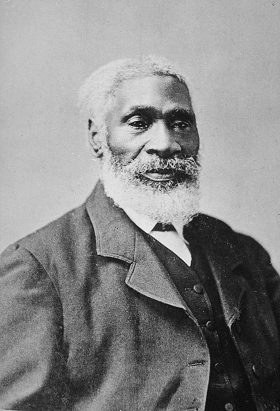 Uncle Tom, the novel’s eponymous main character, is almost certainly based on Josiah Henson, a celebrated Canadian hero who, ironically, was one of the greatest champions of the 19th Century black Canadian community. Josiah Henson was born into a life of slavery on a tobacco plantation near the town of Port Tobacco Village, in southern Maryland. His earliest memory is of an incident which followed his father’s decision to beat a white man for assaulting his wife. As punishment, Josiah’s father was shackled to a whipping post and given one hundred lashes. When the scourging was over, his owner nailed Josiah’s father’s right ear to the post and severed it with a knife. Despite the cruelty and fear which were part and parcel of life as a plantation slave, Josiah Henson’s early years were not devoid of happiness. His mother raised him to be a devout Christian, teaching him about God and Christ and frequently reciting the Lord’s Prayer. His faith was of immense importance to him, and would direct his actions throughout his life. When his master died, Josiah’s brothers and sisters were sold to various slave owners. As Josiah was the youngest of six siblings, his mother begged her new owner, Isaac Riley, to allow him to stay with her. When little Josiah fell ill in his mother’s absence, Riley purchased him from the owner to which he had been sold on the condition that he labour in the fields. Josiah and his mother were relocated fifty miles north to Riley’s farm, situated north of Washington, D.C. Josiah grew into an athletic and intelligent young man. He also proved to be an industrious and resourceful worker, and Isaac Riley took note of his strong character. Over the years, he climbed the ranks of the slave hierarchy, eventually becoming the farm’s overseer. When he was 22 years old, he married a woman from a neighbouring family. The couple would eventually have twelve children together. In 1825, Isaac Riley was sued by his brother-in-law and was forced to lend out some of his slaves. With tears in his eyes, he begged Josiah Henson, the only of his slaves that he could trust, to march eighteen of his fellow inmates across what is now West Virginia to his brother’s plantation in Kentucky. Henson did as his master requested, ignoring the tempting opportunity to slip into Ohio, a free state, out a sense of duty. When they finally reached Kentucky, Henson and his charges became the temporary property of Isaac’s brother, Amos. While working for Amos Riley, Henson met a Methodist Episcopal preacher who began to teach him his profession. In 1825, the preacher suggested a clever method by which Henson might earn his freedom in a manner satisfying his sense of honour. Seeing that Henson was an intelligent man and a gifted orator, he suggested that he ask Amos Riley for permission to visit his old master. On the road to Maryland, he could deliver sermons, for which grateful audiences would give him donations. He could then use these donations to buy his freedom from Isaac Riley. Josiah Henson took the preacher’s advice and, with Amos’ permission, made his way back to Maryland, preaching as he went. His sermons earned him $350. When he returned to Isaac’s farm, he offered his master all his savings, as well as an additional $100 which he would pay with his labour, in exchange for his freedom. Riley took Henson’s money and agreed to his proposal, but not before duplicitously adding an addition ‘0’ to the contract, requiring Henson to give him $1000-worth of his labour rather than the $100 originally agreed upon. Dejected, Henson returned to Amos Riley’s Kentucky farm. In 1830, Josiah Henson accompanied Amos Riley on a trip, at the end of which Henson suspected Riley might sell him to another owner, thus separating him from his wife and children. One night, while Riley was asleep, Henson grabbed an axe and prepared to murder his master so that he might escape this fate and flee to Canada with his family. As he raised the axe, he remembered his Christian values and decided to let Riley live. Riley subsequently became gravely ill, and only managed to survive due to Henson’s ministrations. The sale of Henson to another slave owner, if indeed that was the purpose of Riley’s business venture, never took place. Upon returning to Amos Riley’s farm, Henson- along with his wife, Nancy, and their four children- escaped and made for Upper Canada, where slavery was all but outlawed, via the Underground Railroad. Henson carried his two youngest children on his back in a crude knapsack made from a single sheet of cloth. “As we advanced, we could discover Indians peeping at us from behind the trees, and dodging out of sight if they thought we were looking at them. Presently we came upon their wigwams, and saw a fine-looking, stately Indian, with his arms folded, waiting for us to approach. He was, apparently, the chief; and, saluting us civilly, he soon discovered we were human beings, and spoke to his young men, who were scattered about, and made them come in and give up their foolish fears. When the natives sufficiently acquainted themselves with the strange-looking newcomers, they treated them to a bountiful meal and gave them the use of one of their wigwams for the night. When they finally arrived in Canada, Josiah Henson and his family found employment on a succession of farms near Fort Erie (a town situated at the head of the Niagara River), the westerly city of Waterloo (adjacent to Kitchener, Ontario), and the southerly community of Colchester (on the northwestern shores of Lake Erie). When they had saved sufficient money, the Henson family established Dawn, a black community situated between Lakes Huron and Erie. There, Henson founded a vocational school for black labourers, believing that African-American refugees to Canada ought to hone their occupational skills before attempting to integrate into Canadian society. Henson’s institution flourished, and in no time, Dawn boasted a population of 500. Under Henson’s guidance, the townspeople established a sawmill, which they used to mill local black walnut wood for export to Britain and the United States. Henson himself resumed work as a Methodist preacher, a vocation he had begun on Amos Riley’s farm, and began to speak publicly in favour of American abolition. In early December, 1837, a thousand American-born Upper Canadians, angry at the colonial British government for denying them political rights, assembled at a Toronto tavern. About 600 of them, under the leadership of Scottish-born politician William Lyon Mackenzie, armed themselves with hunting muskets and pitchforks and marched down Yonge Street, where they engaged in a minor skirmish with a much smaller government force. Word of the revolt spread quickly throughout Upper Canada, and soon a thousand local settlers volunteered to help take back the tavern. Among these volunteers were hundreds of black militiamen who, knowing that Mackenzie’s rebellion was backed by American expansionists, would do anything to ensure that Upper Canada kept from falling into the hands of the United States. One of these black militiamen was Josiah Henson, who led a unit comprised of his fellow Dawn settlers. Mackenzie’s rebels scattered in the face of the thousand-man militia that marched to oppose them and the Upper Canada Rebellion of 1837, as it was called, ended as quickly as it began. Far from abandoning his crusade, however, William Lyon Mackenzie began preparing for another assault on Upper Canada’s colonial government. Aided by the United States, Mackenzie commissioned a crew of rebels with ferrying troops and supplies from Detroit to the proximate district of Sandwich (present-day Windsor, Ontario), on the other side of the Detroit River. Exactly a month after Mackenzie’s failed uprising, Josiah Henson led fifty black militiamen in capturing the Ann, the ship the rebels had been using to transport their American supplies to Sandwich. This victory was a major blow to Mackenzie’s cause, constituting a substantial nail in the coffin of his rebellion. In 1841, Josiah Henson and his family moved to Dresden, Ontario. The following year, he established the British-American Institute, a school for all ages intended to provide a general education to fugitive slaves. In 1849, Josiah Henson published his memoirs, entitled The Life of Josiah Henson, Formerly a Slave, Now an Inhabitant of Canada, as Narrated by Himself. At that time, Henson himself had not yet learned to read and write. He was able to get his story into print by dictating it to Samuel A. Eliot, a former mayor of Boston, Massachusetts, well known for his opposition to slavery. 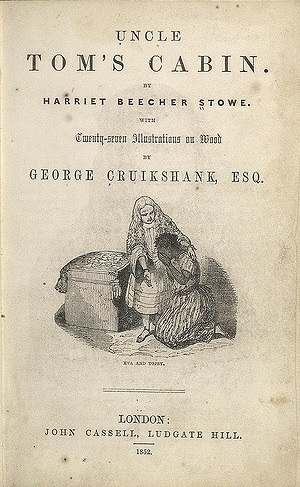 Henson’s story, in part, inspired U.S. novelist Harriet Beecher Stowe to write Uncle Tom’s Cabin (1852), an American classic which helped turn American popular opinion in favour of abolition. Uncle Tom’s Cabin would become the second best-selling book in American in the 19th Century, eclipsed only by the Bible. Many believed that Stowe’s book was an integral impetus for the abolitionist movement which led to the American Civil War. The novel’s titular character, the selfless, devoutly Christian Uncle Tom, is based on Josiah Henson. The success of Stowe’s book prompted Henson to republish his memoirs under the title Truth Stranger Than Fiction: Father Henson’s Story of His Own Life (1858). Henson wrote a second, more detailed autobiography, entitled Uncle Tom’s Story of His Life: An Autobiography of the Rev. Josiah Henson, in 1876. On May 5, 1883, 93-year-old Josiah Henson passed away in his home in Dresden, Ontario. A century after his death, the portrait of this celebrated Canadian hero was featured on a Canadian 32 cent stamp, making Josiah Henson the first black Canadian to acquire this distinction. Today, the home of Henson’s former master, Isaac Riley, (known locally as ‘Uncle Tom’s Cabin’) is listed on the National Register of Historic Places. The Uncle Tom’s Cabin Historic Site, located near Dresden, Ontario, is dedicated to his memory. If you’re a fan of old Westerns, chances are that you’re familiar with the snake oil salesman- the slick confidence man who rides into town with a cart filled with worthless patent medicines, falsely accredits his potions with curative properties, sells his wares to a handful of gullible customers, and hits the trail before his deception can be found out. This character derives from actual 19th Century American quack doctors who passed bottles of mineral oil off as genuine snake oil- a traditional Chinese medicine. A few weeks ago, my friend, Kevin Guhl, while working on a fascinating research project that will knock the socks off the Fortean community, came across the tale of Kelly Chamandy, Canada’s most famous bear oil salesman. Chamandy was a 20th Century woodsman from northern Ontario who garnered international renown for selling bottles of black bear grease to balding men and women, alleging that his ursine pomade helped to reverse hair loss. Quite unjustly, I was quick to categorize him as a sort of Canadian snake oil salesman- an unscrupulous businessman who preyed on people’s hopes and fears in the pursuit of profit. A closer look at this most colourful of characters, however, reveals another picture entirely. Kelly Chamandy was born in 1902 in the city of North Bay, Ontario, on the northern shores of Lake Nipissing. His father, A.K. Chamandy, was a Syrian peddler who named his son after his friend and neighbour, an Irishman who had treated him and his wife kindly upon their immigration to Canada. When he was still a young boy, Kelly’s family moved 370 kilometres north to the town of Cochrane, Ontario, where his father opened his first store. There, at the age of six, while riding in a packsack on the back of a Cree Indian, he saw his first black bear- an animal around which his life would come to revolve. When he came of age, Kelly headed to the woods of Northern Ontario and became a fur trader. His subsequent adventures formed the basis of many a tale, both tall and true, to which he would often treat visitors to his store. On this hunting trip, while boating along the coast of North Twin Island (a large isle in the middle of James Bay), Kelly and his companions saw a huge polar bear with her cub walking along the shore. 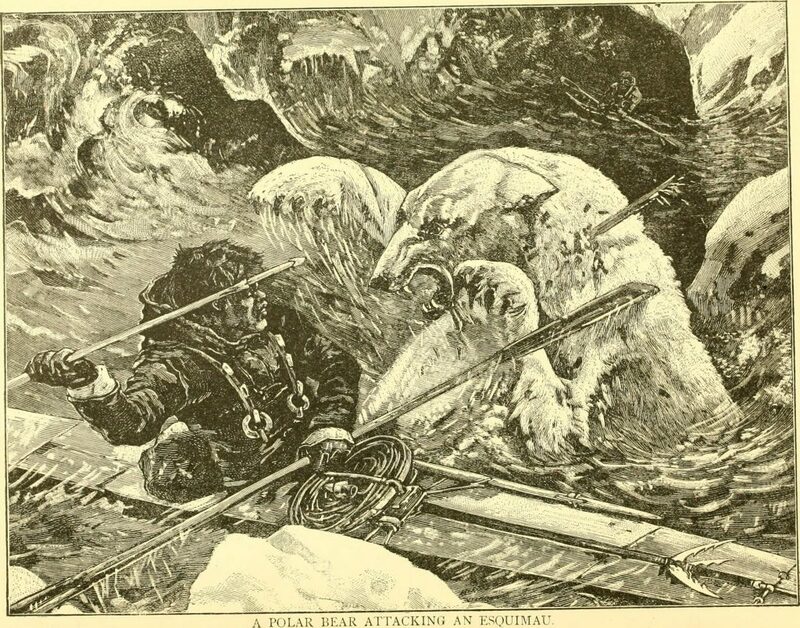 Brandishing spears, the Inuit disembarked with three of their dogs and prepared to hunt the mother bear the traditional way. Another tale with which Kelly would often regale tourists was the story of a wrestling match that he claimed to have won against a bear during a springtime business trip to a Cree village. While attempting to cross a steam, he leapt from a high rock to a ledge on the bank. 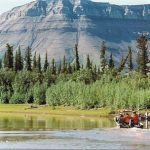 Upon landing, he found himself sharing the ledge with an enormous grizzly which had been looming over the water with its paw extended, attempting to catch fish. The ledge was too high to jump from, and the bear was blocking the only exit. When Kelly cautiously approached the animal, it lunged at him. For about thirty seconds, Kelly Chamandy- a burly, bearlike man himself, with broad shoulders and thick, muscular arms- grappled with the monster. Finally, he pressed his back against the rock wall behind him and delivered a two-footed kick to the bear’s belly, sending the bruin behemoth crashing into the stream below. 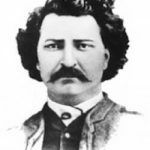 Kelly Chamandy eventually established an independent fur trading post in the town of Moosonee, about twelve miles up the Moose River from James Bay. There, in the late 1930s, he met a tall, grey-eyed woman named Frances Violet Pullen. Ten years his junior, Frances was the daughter of a local railway foreman. Kelly courted and married Frances, and a year later, the couple had their first child- a son named Monty. About a month after Monty’s birth, Kelly Chamandy reported on the dramatic rescue of a 15-man French-Canadian survey team, the members of which nearly starved to death in the frozen muskeg country of Northern Quebec, having failed to find the food cache that had been prepared for them on account of heavy snowfall. Chamandy interviewed 32-year-old Leo Bernier, the most emaciated of the crew, while he lay on a bed in a Moosonee inn. Bernier’s account, which Kelly translated from French to English, was published in the January 3, 1938 issue of the Ottawa Evening Citizen. A year and a half later, Kelly Chamandy had his own brush with disaster. In early July, 1939, Kelly, his wife Frances, and their 17-month-old son Monty- along with four Cree employees named Tom Linklater, Willie Isserhoff, John Wesley, and Alec Simion- set out on a fur-buying trip. They piled into the Kittiwake, a 40-foot-long fishing boat which Kelly had purchased shortly after his wedding, and headed down the Moose River into James Bay, bound for the Cree village of Attawapiskat. 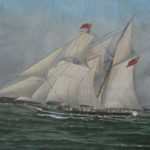 While they were on the water, a ferocious gale blew in from the north and inflicted serious damage upon Chamandy’s vessel. 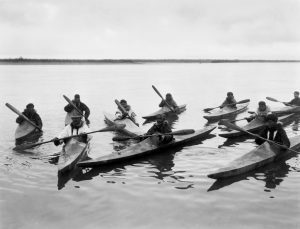 The crew was forced to abandon the craft and row for shore in a canoe. Although the seven passengers safely made landfall at a place called Partridge Creek, the Kittiwake was wrecked beyond repair, bringing $35,000-worth of Kelly Chamandy’s trade goods with it to the bottom of James Bay. Six months later, Chamandy was hit with another misfortune: his family’s cabin at Moosonee mysteriously burned to the ground. By that time, war had broken out in Europe, and in order to both support his family (which would soon gain another member, baby Ulna) and serve his country, Kelly Chamandy enlisted in the Royal Canadian Air Force. When he finally came home for good at the end of the war, Kelly Chamandy was bald as an egg. Taking the advice of his Cree friends, he began massaging rendered bear fat into his scalp and, lo and behold, his hair began to grow back! The state of his pate, his Syrian peddler heritage, and his wilderness experience gave him a brilliant idea which led to his entrance into an ancient, unconventional, and all-but-forgotten industry: the bear grease market. 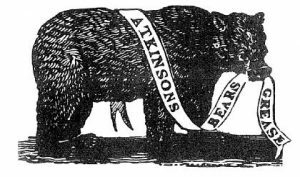 From the mid-1600s until the end of the 19th Century, many wealthy Europeans anointed their scalps and greased their whiskers with the rendered fat of Russian brown bears, hoping that the tallow contained the same mysterious property which gave bears their thick winter coats. Antiquated though it was, this practice was by no means obsolete by the time Kelly Chamandy decided to enter the market in the 1940s. He promptly opened a store in the hamlet of Ramore, Ontario, located about 200 miles south of Moosonee, and began to make his own bear grease, rendering the fat of black bears he killed in the late summer or early fall, right before hibernation, in a washtub over his cabin’s wood stove. No sooner had he set up shop than his bottles began to fly off the shelf. 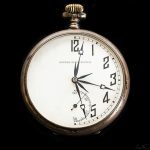 In no time, Kelly Chamandy was selling his exotic commodity to clients from all over North America, the going price being $1.50 for an eight-ounce jar. Although Kelly may not have outright ascribed his bear grease with follicle-friendly features, he was not beyond dropping some not-so-subtle hints to the same effect. “Have you ever seen a bald-headed Indian?” he would often ask tourists, before explaining that natives from the prairies to the Great Lakes would often work bear oil into their long hair to make it shine. 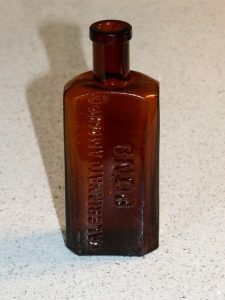 Baldness was not the only ailment for which Kelly Chamandy’s bear oil was used to affect a cure. Customers also used the grease to combat rheumatism, arthritis, and muscle aches, and applied it as a lubricant, waterproofing agent, and conditioner to everything from fishing lines to boot leather. Kelly Chamandy soon expanded his product line, becoming Canada’s only licenced purveyor of bear, beaver, muskrat, and raccoon meat. He sold his bear and beaver meat at 35 cents a pound, and retailed his untanned pelts for up to $25. He also sold bear gallbladders and left forepaws to Chinese merchants, bear bile and bear paw soup being rare and expensive ingredients in traditional Chinese medicine, as well as live black bear cubs, whom gas station, restaurant, and hotel owners purchased in the hope of attracting patrons to their establishments. 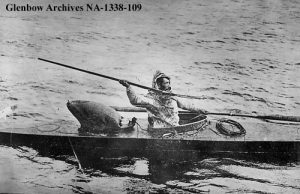 Soon, Kelly’s profits allowed him to open a gas station, a trading post, a general store, and a museum, his main articles for sale and display being Inuit soapstone and ivory carvings which he purchased from his old fur trade friends. In the spring of 1951, Kelly Chamandy offered a $100 reward to anyone who could bring him the carcass of an enormous black bird that had been harassing Northern Ontario livestock; apparently, he thought that the monster would make a nice addition to his museum. Ted Lind and Howard McDonald were two farmers who claimed to have seen the bird about 50 miles east of Timmins, Ontario (i.e. in the vicinity of Ramore). 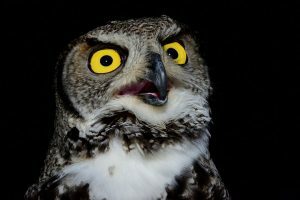 They described the bird as having huge talons, a hooked beak, jet black feathers, and the likeness of an owl, and claimed that it was four feet tall with a 9-foot wingspan. Lind suspected that the avian colossus had snatched up fish and meat that he had strung up beyond the reach of wolves; all that survived of his catch were the tattered remains of the half-inch rope from which he had suspended it. Chamandy himself maintained that the bird had yellow eyes “the size of silver dollars”, and was “large enough to carry off a small cow”. Within a few days, Kelly Chamandy upped the bounty to $150 on the condition that the bird be captured alive. According to an article in the Pittsburgh Press, the entrepreneur feared that his initial offer would prompt locals to “commit wholesale slaughter of birds, shooting first and examining them afterwards”. To the best of this author’s knowledge, the fate of the monstrous bird remains a mystery. Later on, in 1952, Kelly sent a jar to U.S. Army General Dwight D. Eisenhower as an inauguration present (Eisenhower was elected U.S. President in the fall of 1952). He never received a reply. Two years later, in the summer of 1954, Kelly sent a bottle of bear grease to Prince Philip, Duke of Edinburgh, whose hair appeared to be thinning. This time, he promptly received a Royal letter from the Honourable Michael Parker, the Duke’s Private Secretary, thanking him for his concern and assuring him that “there is no cause for worry”. On February 24, 1966, after successfully bidding for a truckload of abandoned bicycles at a police auction, 64-year-old Kelly Chamandy suddenly died of a heart attack, leaving behind his wife, Frances; his children, Monty and Ulna; and a legacy of happy customers with heads full of hair and hearts full of gratitude for the services rendered by Canada’s last bear oil salesman. 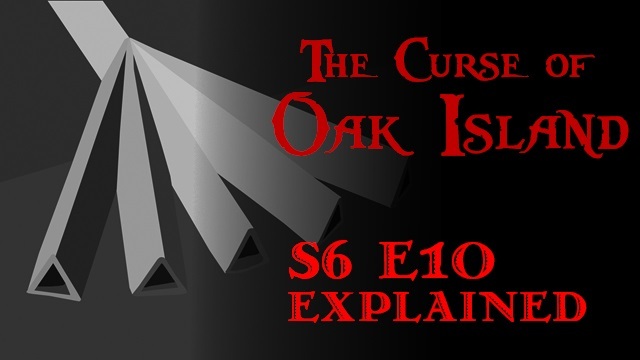 The following is a Plot Summary and Analysis of Season 6, Episode 10 of the History Channel’s TV series The Curse of Oak Island. The Lagina brothers visit Smith’s Cove, where Billy Gerhardt, Terry Matheson, and Laird Niven have fully uncovered the mysterious underground wall discovered the previous episode. Niven tells the brothers his theory regarding the structure’s formation, saying, “Basically, they crudely tapered the boards, drove them into the C horizon [the substratum, or layer of unweathered rocks beneath the subsoil], ‘til they kind of curled up and stopped.” Matheson then proposes that “somebody dug on the shoreward side of this structure” and tried to pack its base and sides with clay. In an interview, Marty Lagina expresses frustration at this new discovery, remarking: “These walls don’t appear to be consistent in material, they don’t appear to be consistent in construction, [and] they don’t give away, in an obvious sense, what on earth their purpose was.” Rick Lagina, however, remains optimistic, stating that they might find additional clues in Smith’s Cove which might help to shed some light on this new mystery. Later, Alex Lagina, Doug Crowell, and Paul Troutman drive to the Lordly House in Chester, Nova Scotia- a museum dedicated to the preservation of local heritage. 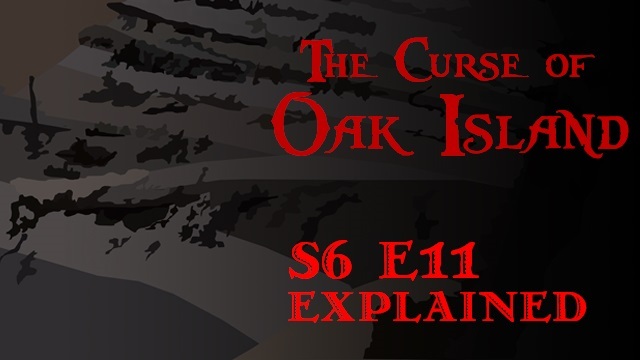 There, they gain access to the museum’s documents on Oak Island and begin to read through them. Troutman quickly unearths a letter written by Gilbert Hedden (a former Oak Island treasure hunter) to his lawyer, R.V. Harris, in 1936, in which he describes his discovery of an underground wooden structure in Smith’s Cove. In his letter, Hedden includes a diagram of the structure, which bears inscriptions of Roman numerals similar to the U-shaped structure. Crowell remarks that these finger drains would fit inside the U-shaped structure, and suggests that the U-shaped structure constitutes the remains of a cofferdam used by either the box drains’ original builders or by treasure hunters who attempted to dismantle them. Later, the Oak Island crew congregates at the Mug & Anchor Pub in Mahone Bay. Doug Crowell relates the recent discovery of the 1863 newspaper article, whereupon Marty Lagina affirms that the article’s description of the finger drains being 66 feet apart corresponds with the dimensions of the U-shaped structure, which measures “20 metres [65.6 feet] across the leading edge”. Crowell then relates the article’s description of the finger drains, and suggests that if they find an abundance of flat stones at Smith’s Cove, they may constitute the remains of finger drains which were dismantled by previous searchers. The treasure hunters agree that further excavation is required at Smith’s Cove. Following the operation, Martin explains that DPC-1 deviated 8.7 feet east and 4 feet north”. 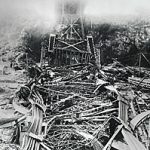 At the 100-foot depth, where Tester anticipated the presence of the Shaft 6 tunnel, the hole deviated 5.3 feet east and 2.5 feet north. Tester expresses some surprise at the degree of deviation and tasks Martin with conducting tests on the rest of the holes. 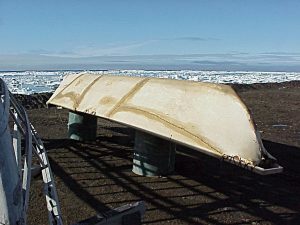 Later, Charles Barkhouse and Doug Crowell head to Smith’s Cove, where they begin to drain a pool of water which has collected beside the wooden wall. When Crowell voices his curiosity as to the structure’s purpose, Barkhouse suggests that it might have been created in an attempt to block the drains which fed the flood tunnel. While Barkhouse mans the pump, Crowell observes a triangle-shaped opening between two stones from which seawater appears to be steadily trickling. The historian suggests that this triangular gap evokes the Yarmouth Herald’s description of the finger drains being “open at the top and closed and the bottom”. Crowell calls up Rick Lagina and informs him of the find. 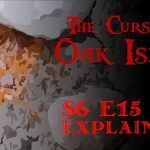 Rick comes to Smith’s Cove, examines the rocks, and concurs with Crowell’s suggestion that they might indeed comprise a section of the legendary box drains. The rest of the team is called over, whereupon the rocks are cleaned off with water. Laird Niven then examines to formation in order to determine whether or not it is manmade. While Niven works, Charles Barkhouse discovers a handful of what appears to be coconut fibre in the depression near the base of the wooden wall. “There’s a whole bunch of it right in here,” he explains. “Like, a level of it”. The treasure hunters agree that the proximity of coconut fibre bolsters the notion that these rocks are indeed part of the finger drains and decide that further investigation is in order. 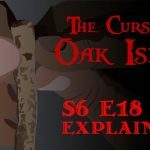 Later that day, Rick Lagina, Craig Tester, and Dan Henskee accompany gyroscope operator Tory Martin to a copse near the Money Pit area and the Old Well (the “Old Well” being a feature introduced by Fred Nolan in Season 3, Episode 8), where Martin happened to spy a strange stone in the grass. 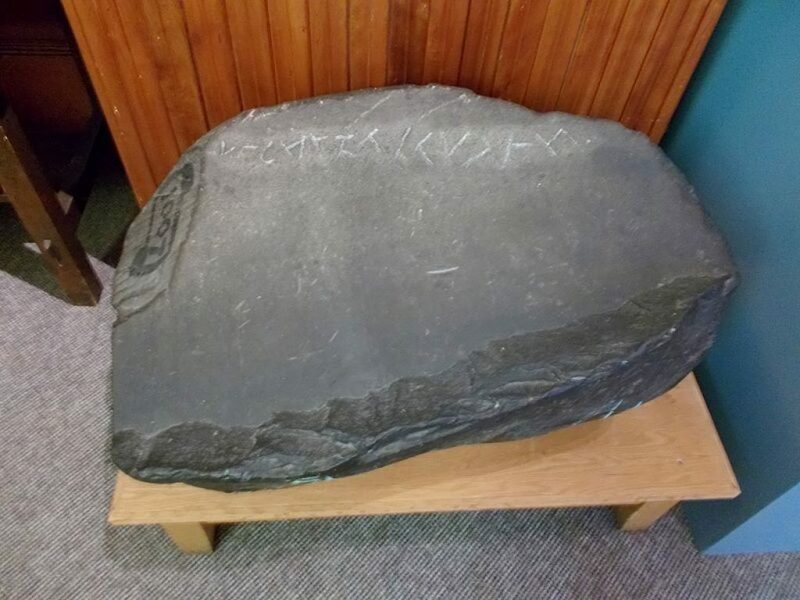 The stone has a flat face pocked with shallow markings and a long groove which Martin suggests might be weathered carvings. Rick Lagina splashes some water on the depressions, which indeed appear to be man-made markings. That evening, Rick and Marty Lagina, Craig Tester, Terry Matheson, and Paul Troutman meet at the Oak Island Research Centre to discuss Martin’s new discovery. Matheson explains that the stone is metamorphosed grewacke, the second most common boulder on Oak Island (next to granite), and opines that the long groove on its surface appears to have been cut, while the other markings appear to have been chiselled. He further suggests that the stone may have once served as “a decorative piece at the base of a building block”. The treasure hunters agree that they ought to conduct a laser scan of this stone. Several days later, Doug Crowell and Paul Troutman meet at the Oak Island Research Centre with Rob Hyslop and Ryan Levangie of Azimuth Consulting Ltd., the men who conducted the LIDAR scan of the supposed 90-foot stone in Season 6, Episode 8. Hyslop and Levangie coat the stone’s surface with a thin layer of talcum powder in order to increase its reflectivity before mapping it with their Trimble CX 3D laser scanner. Meanwhile, Rick Lagina, Craig Tester, and Terry Matheson continue the excavation of Smith’s Cove. Using a backhoe, they quickly unearth three wooden boards which had been standing upright alongside each other similar to the wooden wall nearby. The bottoms of these boards have been fashioned into wedges, suggesting that they had been driven into the earth. In this episode, Alex Lagina, Doug Crowell, and Paul Troutman discovered a 1936 letter written by Gilbert Hedden to his lawyer, R.V. Harris, in the Lordly House in Chester, Nova Scotia. In this letter, Hedden described his discovery of a subterranean wooden structure bearing Roman numerals in Smith’s Cove. The treasure hunters suspected that this wooden structure was built by the same people who constructed the U-shaped structure. Decades later, Dan Blankenship and David Tobias of Triton Alliance discovered more wooden objects like this which, when put together, appeared to actually be the remains of an ancient cofferdam erected by either the original Money Pit builders or previous searchers. 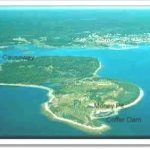 In this episode, Doug Crowell unearthed an article in the February 19, 1863 issue of the Yarmouth Herald which appeared to be the earliest written reference to the drains which are believed to have funnelled water into the Smith’s Cove flood tunnel. This article described the stone drains as being “open at the bottom and enclosed at the top”. Doug Crowell interpreted this description as an implication that the drain hole was triangular in shape, and not rectangular, as the term ‘box drain’ (which the structures have often been called) implies. In accordance with this discovery, the narrator referred to the Smith’s Cove ‘box drains’ as “finger drains” throughout much of this episode. While draining a pool of water at the base of the mysterious wooden wall at Smith’s Cove, Charles Barkhouse and Doug Crowell discovered two large rocks leaning against each other. Beneath the rocks’ intersection was a triangular hole from which water continually leaked. Crowell observed that this hole appeared to correspond with the aforementioned 1863 Yarmouth Herald’s description of the Smith’s Cove finger drains, and proposed that the rocks might indeed comprise a section of these drains. Charles Barkhouse’s discovery of coconut fibre nearby appears to bolster this theory. Near the end of the episode, gyroscope operator Tory Martin, who was invited to the island to determine the straightness of several drillholes in the Money Pit area, happened upon a strange-looking stone near the Old Well (an Oak Island landmark introduced by Fred Nolan back in Season 3, Episode 8). That flat stone, which Terry Matheson determined to be made of metamorphosed grewacke, bears what appear to be man-made carvings. Specifically, these carvings include a long, deep horizontal line, along with many shorter perpendicular lines carved an inch or two away from the former. Rob Hyslop and Ryan Levangie of Azimuth Consulting Ltd. conducted a laser scan of this stone, the results from which they will likely reveal in the next episode. 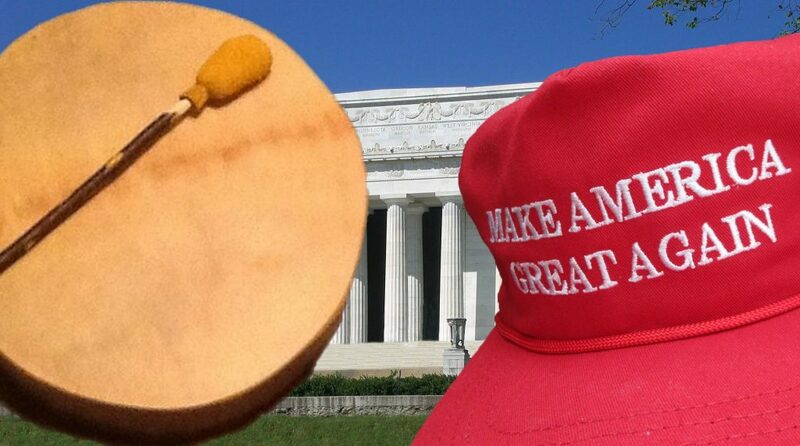 From Fox News to CNN, mainstream media outlets across North America are abuzz with the story of a tense encounter between a MAGA hat-wearing high school student and a drum-wielding Native American veteran which took place outside the Lincoln Memorial in Washington, D.C., last Friday (January 18, 2019). The 17-year-old student, who attends Covington Catholic High School in Park Hills, Kentucky, had travelled to Washington with his class in order to attend the March for Life, an annual pro-life rally. The 64-year-old Native American veteran, on the other hand, had come to the U.S. capital to attend the very first Indigenous People’s March, a political demonstration intended to draw attention to injustices perpetrated against indigenous peoples around the world. 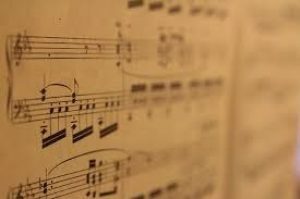 The two groups came into contact with each other, whereupon the two main characters of this story engaged in an awkward standoff in which the veteran sang and beat a hand drum close to the student’s face while the 17-year-old field-tripper stared at him, grinning. Early reports of the incident were quick to denounce the student’s smirking as an example of the sort of disrespect which the Indigenous People’s March was intended to address, alleging that the student and his classmates had surrounded the veteran and his fellow Native American protestors before rudely mocking them and their traditional culture. Newly-released videos, however, clearly show that the veteran and his fellow protestors were the instigators of the encounter. During the strange stalemate that ensued, one of the protestors began hurling insults at the predominantly white high school students, shouting “this is not your land” and “go back to Europe”. The teenage students responded to these taunts by reciting their own high school spirit chant. According to an introductory paragraph on this website’s homepage, MysteriesOfCanada.com was created back in 1998 in order to “help Canadians better understand the history, geography, myths and legends of their own country.” As such, I try to focus my articles on Canadian history and folklore, and often find myself referencing the mythology of various Canadian ethnic groups. Although the following piece may seem thematically incongruous with the articles that I usually post, I submit that it is not entirely out of place, as it addresses that which the official purpose of the Indigenous People’s March, the racially-charged invectives of the Native American protestor, and the mainstream media’s kneejerk reaction to the aforementioned story all evoke: a popular Canadian narrative which also happens to be one of Canada’s greatest myths. The truths that I will lay out in this article are uncomfortable, and I take no pleasure in writing them. I would much rather spend my time resurrecting an old Sasquatch story buried in some bygone men’s magazine or cobbling together a biography of a long-forgotten Canadian gunslinger. However, the perpetual reiteration of this Great Canadian Myth by the mainstream media and various provincial curricula, along with the negative consequences of the myth’s proliferation, has convinced me that history nerds like myself have a civic duty to at least attempt to set the record straight. So here goes! Before the coming of the white man, Canada’s First Nations lived in peace and harmony with nature and with each other. The concept of personal property was foreign to them, and thus they shared the land and its resources freely with one another, devoid of any semblance of greed or jealousy. In the dim recesses of Canada’s past, European explorers appeared on Canada’s eastern shores and claimed the land they “discovered” for their respective monarchs. In the centuries that ensued, evil European colonists, consumed by greed, stole the land from the natives by force. In the 1880s, the Canadian government passed a law which decreed that all First Nations children be hauled from their families and thrown into residential schools, where they were forced to abandon their traditional cultures and assimilate into a European one. The horrors these native children endured at these residential schools, from brutal beatings to sexual abuse, were so traumatic that they prevented that entire generation, and all their succeeding generations, from getting back on their feet and enjoying happy, fulfilling lives in this new Europeanized Canada so different from the wild land that their ancestors knew. To this very day, First Nations communities across the country are rife with alcohol addiction, drug abuse, and suicide- all of these things after-effects of the residential schools and the callous brutality of the racist white colonizers who ran them. All white Canadians today are personally responsible for the current issues faced by various indigenous communities across the country, and are morally obliged to continually and eternally pay the First Nations reparations for their grievances via taxes. The aforementioned reparations will help Canada’s First Nations communities climb out of the slump in which they currently find themselves. I will address each of these myths in the order in which I introduced them. A few years ago, I had the opportunity to flip through one of Alberta’s current elementary school Social Studies textbooks. 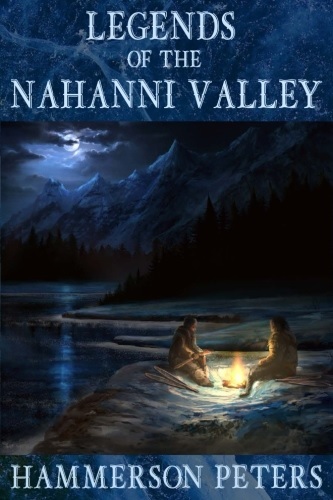 In this book, I came across a three-page article detailing the Iroquois legend of the Great Peacemaker- a 15th Century prophet who united the Mohawk, Seneca, Onondaga, Oneida, and Cayuga Nations to form the mighty Iroquois Confederacy. 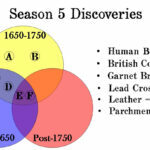 The article was written in such a way that, to the Albertan elementary school student unfamiliar with the history of New France, it would likely convey the idea that the Iroquois were model peacemakers, and that the European colonists who ran roughshod over Canada’s First Nations throughout the 17th, 18th, and 19th Centuries would have done well by taking a page or two from their book. In reality, nothing could be farther from the truth. The Iroquois were a ferocious and warlike people who constantly battled with their hereditary foes, the various Algonquin tribes that lived north of the St. Lawrence River. When New France was but a fantasy in the mind of Samuel de Champlain, the Iroquois were busy wiping out the Neutral Nation, an enemy tribe that lived between Lakes Huron, Erie, and Ontario. When Jesuit missionaries attempted to evangelize them in the 1600s, Iroquois braves tortured these men of cloth to death, burning them with red-hot tomahawk blades, stripping the flesh from their limbs to the bone, and mocking the sacrament of baptism by pouring boiling water over their heads. And when pregnant French women fell into their clutches following the 1689 Massacre of Lachine, they cut their unborn babies from their wombs, roasted them over a fire, and ate them before their very eyes. 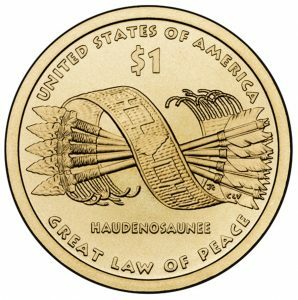 The idea that the Iroquois were champions of peace because a 15th Century medicine man brokered a powerful alliance between their five tribes is akin to the suggestion that the 13th Century Monglian warlord Genghis Khan ought to be accorded the same honour for uniting the tribes of Northeast Asia and establishing the Pax Mongolica in the wake of his bloody conquests. While trivial, the little Social Studies lesson that I came across serves to illustrate the pervasiveness of the notion that Canada’s First Peoples lived an idyllic, harmonious existence prior to the arrival of the white man- a concept that is so fanciful as to border on absurd. Like nearly every society in the history of our species, the various cultures that constitute Canada’s pre-Columbian First Nations were riddled with practices and beliefs which would appall our modern Western sensibilities. As an avid student of First Nations history and culture, and as a proud card-carrying member of the Metis Nation of Alberta, it is not at all my intention to malign Canada’s First Nations, some of whom were my ancestors. As such, I will dedicate no more words to this topic than are necessary, despite that frontier accounts of First Nations atrocities are sufficiently numerous to fill a book. To give a few more examples that illustrate my point: the Haida of the Pacific Northwest were notorious raiders and slavers; the Dene nations of the Canadian North treated their women like beasts of burden; and the Blackfoot of the Canadian prairies gloried in warfare and thievery. 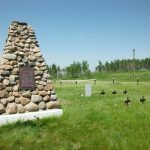 Suffice to say that Canada’s First Nations, prior to the settlement of the Canadian frontier, were no angels. One popular facet of the Great Canadian Myth contends that evil European colonists stole the land from the indigenous peoples of the Americas- a belief epitomized by the Native American protester who shouted “this is not your land” and “go back to Europe” at the students of Covington Catholic High School. In order to determine the veracity of this notion, we must first examine the historic relationship between the indigenous people of the Americas and the continent which some modern aboriginals claim as their birthright. Native Americans, of course, are not truly native to the Americas. 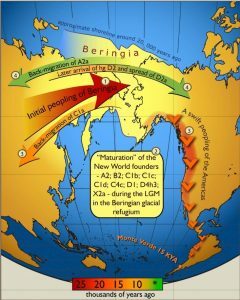 The ancestors of most Amerindians are believed to have crossed an ancient bridge of land and ice, called Beringia, from Siberia to Alaska somewhere around 11,500 B.C. They were followed by the ancestors of the Dene Nations, who are believed to have made the same trans-Pacific journey between 10,000 and 8,000 B.C. The Dene, in turn, were followed by the ancestors of the modern Inuit, who migrated from Siberia to the Americas around 3,000 B.C. Like every human civilization to walk the earth, the North American Indians have spent the past few thousand years engaged in endless intertribal warfare, violently displacing each other in a never-ending bid for greener pastures. In a sense, the French, English, and Spanish colonists who arrived on the eastern shores of the Americas several centuries ago were simply new tribes engaged in the same pursuit, their efforts aided by superior technology and the benefit of imperial support. The notion that European colonists, upon establishing a foothold in the Americas, proceeded to steal native land by force has some merit in the United States, where the U.S. Army spent decades engaged in brutal Indian Wars with tribes opposed to their encroachment upon their hunting grounds. The same notion holds no water in Canada, however. The only First Nations to be truly conquered by the sword are the native allies of New France, who were finally subdued by the English at the end of the Seven Years’ War. Aside from the short-lived and relatively small-scale North-West Rebellion, there were no Indian Wars in Western Canada as there were in America’s Wild West; in the late 19th Century, after befriending the officers of the North West Mounted Police, the chiefs of the Blackfoot, the Plains Cree, and other western tribes peacefully settled onto Reserves, their traditional way of life having ended with the disappearance of the buffalo, a tragedy for which they were partly culpable. By the late 1800s, indigenous people all throughout Canada found themselves unable to make a living. Furs no longer fetched the prices they once did, and natives of Central Canada could no longer survive on trapping, the trade of their ancestors. Similarly, with the buffalo gone from the prairies, the natives of the Canadian Plains were forced to live off government handouts. The situation was grim for both the First Nations and the Canadian government. In an effort to get the First Nations back on their feet and set them up for success in this new Canada, the Canadian government stipulated that the children of certain tribes attend church-run boarding schools, known today as residential schools. Unfortunately, these institutions largely failed in their mission to equip First Nations children for life in Canadian society. To make matters worse, native accounts of residential school life are filled with horror stories of child abuse- crimes which tragically seem to infiltrate even the highest-minded of institutions, from sports academies to Sunday schools. Today, many First Nations communities across the country face serious problems. Among the most prominent of these is a lack of education. According to a study conducted by Statistics Canada in 2011, only 22.8% of Canada’s aboriginal peoples have completed high school and received some level of post-secondary education. To give this some context, a 2014 study conducted by the Organisation for Economic Co-operation and Development concluded that 53% of Canadians aged 25-64 had received some level of “tertiary education”. First Nations communities are also plagued by substance abuse and mental health issues. According to a 2009 report by Health Canada, the proportion of First Nations populations to report heavy drinking on a weekly basis is double that of general Canadian population, and according BC’s Mental Health and Substance Use Journal, First Nations members are twice as likely to commit suicide as the average Canadian. Some other problems that disproportionately affect First Nations communities include drug abuse, obesity, domestic abuse, and unemployment. According to the Great Canadian Myth, all of these problems are attributable to the childhood trauma experienced at residential schools, which had adverse effects on the mental and emotional development of generations of native students. A closer look at Canadian history, however, reveals several potential problems with this theory. Native Americans were not the only Canadian ethnic groups to suffer widespread childhood trauma. During the so-called “Yellow Terror” of the late 19th Century, Chinese Canadians were treated horrendously by the Canadian government, being forced to live in abject poverty on account of steep head taxes and pitifully-low wages. During the Second World War, the Canadian government forcibly relocated Japanese Canadians to internment camps with atrocious living conditions, where children were frequently separated from their families. Perhaps the most traumatized racial group in history, through no fault of the Canadian government, were Ashkenazi Jews, who were killed by the millions in Nazi death camps during the Holocaust. After WWII, many Holocaust survivors immigrated to Canada. Despite that Chinese, Japanese, and Jewish Canadians all suffered a considerable degree of childhood trauma at one time or another, these racial groups are now among the most successful ethnicities in the entire country. Could it be that Indian residential schools were so much more traumatic than the early Chinese-Canadian experience, Japanese internment camps, and the Holocaust? Or is it possible that there are other factors at play? The words “this is not your land” and “go back to Europe”, which one of the Native American protestors addressed to the Covington kids, echoes a widely held yet seldom spoken tenet of the Great Canadian Myth: that all white Canadians, by dint of their skin colour, are in some way responsible for and morally obliged to remedy the injustices perpetrated by their 17th, 18th, and 19th Century ancestors. In addition to being nonsensical, this argument fails to consider the facts that many 17th, 18th, and 19th Century Irish and French-Canadian settlers were themselves powerless victims of imperial oppression, and that the ancestors of a great number of Caucasian Canadians immigrated to the New World in the 20th Century, long after said injustices were committed. Perhaps the most destructive facet of the Great Canadian Myth is the idea that Canada’s suffering First Nations communities will somehow benefit from additional reparations, courtesy of the Canadian tax payer. This notion ignores what I believe to be the real reasons behind the suffering of Canada’s aboriginal people, namely a lack of incentive and cultural self-esteem, for which the Canadian government is entirely responsible. In the late 1800s, when many Canadian First Nations lost the ability to make their own living, the Canadian government shuffled the last of them onto Reserves and hauled their children off to residential schools. In accordance with human nature, the natives whose needs the Canadian government provided for had little incentive to work. Even if some of them had retained a desire for productive exercise, they lacked the ability to engage in it; unable to hunt due to a scarcity of game and forbidden from warfare and certain religious ceremonies by Canadian law, these people lost their capacity to cultivate virtue in the manner with which they were accustomed. Forced into a life of purposeless indolence, many of them naturally fell into depression and vice- traps from which many of their descendants today have yet to escape. Despite the good intentions which might have led to its creation, the Great Canadian Myth has some devastating consequences for both native and white Canadians. The myth’s obvious adverse effects on white Canucks are illustrated perfectly by the case of the Covington boys. Although the Covington kids were neither the instigators of the confrontation for which they have become infamous nor the perpetrators of the racist acts with which they were initially accused, the media was quick to demonize them solely on the basis of their skin colour. They have since become the target of merciless name-calling by hordes of ill-informed social media users whose opinion of them was formed by the erroneous first reports. They have received death threats, some of them terrifyingly graphic in nature, and have had their names undeservedly tarnished. A cloud for which they were in no way responsible will hang over their heads for the rest of their lives. As terrible as they are, the negative consequences of the Great Canadian Myth on white Canucks pale in comparison to the devastation that this popular fantasy wreaks upon Canada’s First Nations. The twisted logic of the Great Canadian Myth advocates perpetuating the residential system and pouring money into First Nations communities- an approach which will only exacerbate the suffering of Canada’s indigenous peoples for the reasons mentioned in the previous section. Instead of offering a helping hand to Canada’s First Peoples, it only succeeds in strengthening the bars of the cage in which they are trapped. It’s high time that we expose this massive misconception for what it really is and make Canada a better place for both natives and whites. 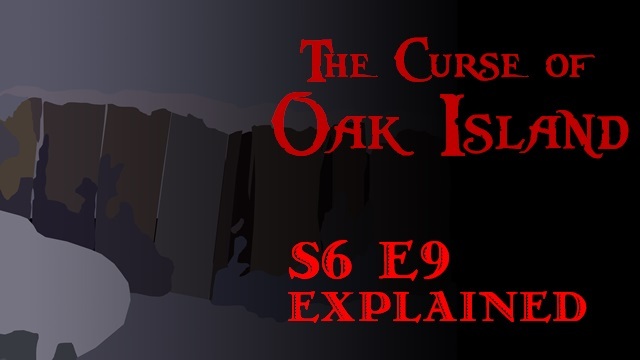 The following is a Plot Summary and Analysis of Season 6, Episode 9 of the History Channel’s TV series The Curse of Oak Island. The Oak Island crew continues their massive excavation at Smith’s Cove, uncovering more of the U-shaped structure rediscovered the previous episode. Charles Barkhouse discovers the Roman numerals ‘XI’ and ‘XII’ carved into one of the structure’s arms. Terry Matheson observes that the U-shaped structure appears to be ensconced in “clay-rich till”, evoking the blue clay allegedly found in the Money Pit by the Onslow Company in the early 1800s. Just before the U-shaped structure is completely uncovered, Gary Drayton examines it with his metal detector and finds it to be completely absent of metal. This finding accords with Dan Blankenship’s discovery that the structure appeared to be fastened together with wooden pegs. Rick Lagina, in a later interview, suggests that the absence of metal is perhaps an indication that the U-shaped structure is “very old”. Upon fully uncovering the structure, the treasure hunters ponder whether the artifact constitutes the leavings the Truro Company or the original depositors. They agree that they ought to dig deeper in the area which the structure encloses. The following day, Marty Lagina meets with Laird Niven at Smith’s Cove. Using a measuring tape, the two men ascertain the length of the three sides of the U-shaped structure and determine the dimensions of the area which the structure encloses. We learn that the eastern arm of the structure measures 65’5’’ in length. Meanwhile, the rest of the Oak Island team meet with Rob Hyslop and Ryan Levangie of Azimuth Consulting Ltd. in the War Room. There, Hyslop and Levangie present the findings of the 3D scan of the supposed 90-foot stone which they conducted in the previous episode. First, they suggest that the ‘N’ carved onto the rock’s surface might actually be an upside-down ‘A’. 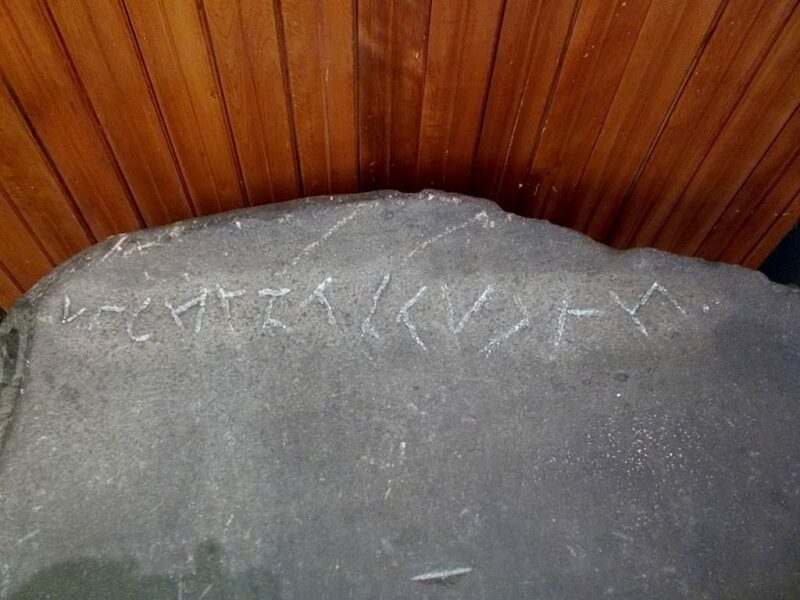 Then they inform the crew that they were unable to make out any additional inscriptions on the stone’s surface, but suggest that more advanced technology may be able to reveal these inscriptions if they indeed exist. Later, Jack Begley and Gary Drayton meet with diver Tony Sampson at a nearby marina. Begley and Drayton board Sampson’s boat and have him ferry them to Apple Island, an area of interest on Travis Taylor’s star map, introduced on Season 6, Episode 7. At the coordinates indicated on Taylor’s map, the treasure hunters discover three large boulders. Following that discovery, the treasure hunters push on into the island’s interior. Gary Drayton pulls out his metal detector and quickly identifies a number of metallic targets, one of which is non-ferrous. The treasure hunters agree that they ought to apply for a permit which will allow them to dig for these targets. Meanwhile, Rick Lagina, Dave Blankenship, Charles Barkhouse, and Doug Crowell head to the Money Pit. There, they watch as Choice Drilling sinks another hole, labelled K5.5, in an attempt to follow the supposed Shaft 6 tunnel to the location of the original Money Pit. Core samples are brought up from the depths of 98-108 and 108-118 feet. The first sample contains what appears to be worked earth, but is devoid of wood. “Maybe they put the supports sporadically,” suggests Charles Barkhouse, referring to the men of the Oak Island Association who built the Shaft 6 tunnel in the mid-1800s. “[Maybe] it’s not a solid roof”. The second sample, on the other hand, is packed with wood from 118-124 feet, prompting the treasure hunters to congratulate themselves on successfully pinpointing the Shaft 6 tunnel. As the wood is located slightly deeper than expected, the narrator suggests that some of it might comprise timber from the collapsed Money Pit. Later, Jack Begley and Gary Drayton sift through spoils from the Smith’s Cove operation, which have been washed and shaken by the wash plant. They quickly discover a coin dated 1963. Meanwhile, Laird Niven, Terry Matheson, and Billy Gerhardt continue the excavation of the U-shaped structure. The bucket of Gerhardt’s backhoe bites into the top of a vertically-aligned timber, which Niven declares to be the third of its kind found that day. A subsequent examination reveals the timber to be a segment of a longer wooden wall composed of similar vertically-aligned planks. “This is totally undiscovered,” says Marty Lagina, having recently arrived on the scene with the other treasure hunters. In a later interview, Marty suggests that this newly-discovered wall might constitutes original workings. 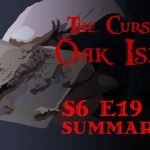 In this episode, the men of Oak Island Tours Inc. finally fully uncover the mysterious U-shaped structure first discovered by Dan Blankenship in 1971. The structure is entombed in what geologist Terry Matheson describes as “clay-rich till”, which Jack Begley suggests evokes the “blue clay” discovered in the Money Pit in the early 1800s by members of the Onslow Company. The structure constitutes the remains of the Truro Company cofferdam built in the summer of 1850 or the Halifax Company cofferdam built in 1866, the “clay-rich till” being either blue clay extracted from the Money Pit itself half a century prior by the Onslow Company or fresh clay taken from the source which supplied the original depositors with their own material. 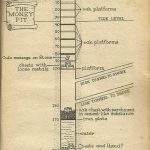 This theory corresponds with the findings of Dan Bankenship’s old partner, David Tobias, and engineer Les MacPhie, who, in the year 2000, carbon dated a piece of the U-shaped structure to 1860, plus or minus thirty years. A second possibility is that the structure is a relic of the original depositors, who employed the same blue clay they used in the Money Pit in its construction. 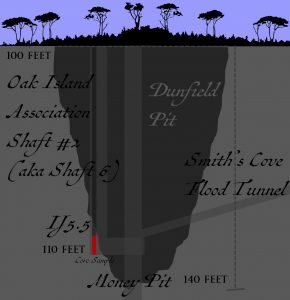 In her 2015 book Oak Island Mystery Solved, Canadian author Joy Steele proposed a third theory which holds that the U-shaped structure was constructed by the original builders and was related to naval stores. Photos which Lee Lamb sent this author show that at least one of these walls was composed of horizontally-aligned planks, not of vertically-aligned planks like those which comprise the wall discovered in this episode. This underground wall at Smith’s Cove, which Terry Matheson suggested might have been used to “hold back water from entering the flood tunnels”, also evokes the wooden wall that Fred Nolan claimed to have discovered in the Oak Island swamp, for which the crew fruitlessly searched in Season 3, Episode 8. Nolan had described this structure as a 12-foot-tall, 12-foot-long wooden wall made of square, sawn timbers, and claimed that he had discovered it in the southern part of the swamp, a short distance from the beach, in 1969. In that episode, the narrator suggested that the swamp wall might be evidence that the swamp is man-made. 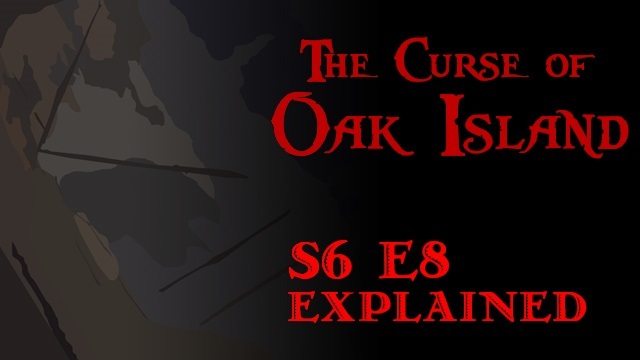 The following is a Plot Summary and Analysis of Season 6, Episode 8 of the History Channel’s TV series The Curse of Oak Island. The episode begins at Smith’s Cove, where the Lagina brothers and Craig Tester watch heavy equipment operator Billy Gerhardt excavate the cofferdammed area with a backhoe. Gerhardt quickly unearths a log, which Tester suspects is a component of the cofferdam that Dan Blankenship built around Smith’s Cove in the 1970s. While Gerhardt works, Gary Drayton sifts through some of the Smith’s Cove spoils he has excavated, which have been rinsed and shaken by the wash plant acquired the previous episode. He discovers a piece of broken pottery among the rocks. Later, Laird Niven meets with Jack Begley, Charles Barkhouse, Doug Crowell, and Paul Troutman at the Oak Island Research Centre. There, the treasure hunters show the archaeologist the suspected 90-foot stone discovered the previous episode. Niven opines that the letters ‘L’ and ‘N’, with which the stone was inscribed, appear to have been carved with a knife, and ventures that the stone’s smooth faces may have been polished. He then suggests that the team use LIDAR scanning technology (LIDAR being an acronym for “light detecting and ranging”) to make a 3D model of the stone’s surface in order to make out any other inscriptions that are invisible to the naked eye. Later, Rick Lagina, Dave Blankenship, Charles Barkhouse, and Doug Crowell head to the Money Pit area, where Choice Drilling is in the process of attempting to determine the orientation of the suspected Shaft 6 Tunnel discovered in Season 6, Episode 5, via exploration drilling. The drillers bring up a core sample from the depths of 108-118 feet and find that it does not contain any wood. This discovery indicates that the hole beside which this new hole was drilled probably failed to intersect the Shaft 6 Tunnel as hoped. As the team prepares the wrap up the operation, Terry Matheson suddenly discovers a piece of wood which appears to be vertically aligned- perhaps the westernmost edge of the Shaft 6 tunnel. The team decides that they ought to drill another hole to the east, hoping to follow the suspected tunnel to the original Money Pit. The next day, Rob Hyslop and Ryan Levangie of Halifax-based 3D scanning company Azimuth Consulting Ltd. meet with members of the Oak Island team in the Oak Island Research Centre. After some pleasantries, Hyslop and Levangie unpack their Trimble CX 3D laser scanner and proceed to scan the stone. The scan is a success, and Hyslop and Levangie leave the Research Centre with a promise to return with their findings. Later that day, Rick and Marty Lagina and Laird Niven head to the area on Lot 24 at which Gary Drayton discovered a number of interesting artifacts the previous episode. Although Rick immediately leaves to attend to other business, Marty watches as Niven forms an archaeological-style grid and begins to excavate the stone-covered area with a trowel. In the same water-filled hole in which Drayton found his artifacts, Niven fishes out a fragment of broken earthenware and a piece of a clay pipe stem. When Niven estimates the latter artifact to date from 1750-1840, Marty says, “I think that we’re looking at something that has to do with Mr. Samuel Ball.” Niven appears to agree, stating that bed of stones which carpet the area “still [have] potential as a cellar”. 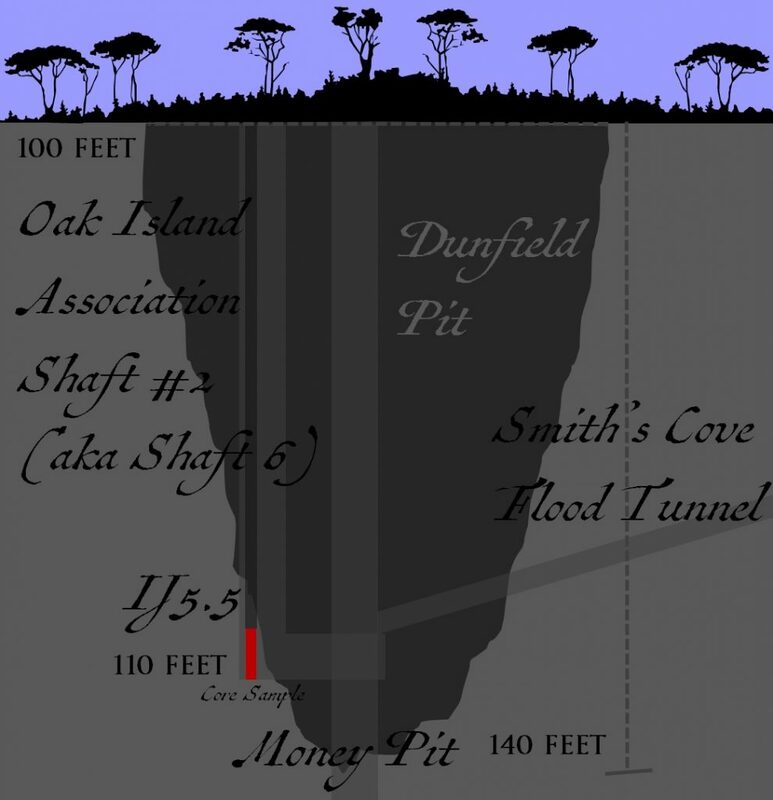 Later that day, the Oak Island team throws itself wholeheartedly into the excavation of Smith’s Cove. 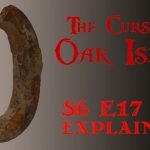 After searching through some of the spoils extracted by Billy Gerhardt and processed by the wash plant, Gary Drayton discovers an 18th Century iron spike. Shortly thereafter, he digs up what appears to be a gold-plated coin, its faces heavily encrusted with hard-packed dirt. The treasure hunters examine the object and determine that its edges do not appear to be “milled”, whereupon the narrator informs us that, in order to combat the practice of “clipping” (shaving small amounts of precious metal from the edge of coins), the British Royal Mint began to produce coins with ridged edges in the late 17th Century. That afternoon, Drayton, Craig Tester, and the Lagina brothers head to the Oak Island Research Centre and show their new find to Paul Troutman. Troutman examines the artifact under a microscope. Sure enough, the object appears to be gold-plated. The treasure hunters agree that they ought to carefully remove the sediment that encrusts it so that they might determine the nature of the artifact. The treasure hunters then proceed with Smith’s Cove and continue with the excavation operation. Using a backhoe, Billy Gerhardt uncovers a wooden beam, which Craig Tester suspects might be an arm of the mysterious U-shaped structure. Rick Lagina and Jack Begley uncover more of this beam with shovels, revealing the Roman numeral “VII” notched into its upper face- an indication that the beam is, indeed, a component of the U-shaped structure. The Oak Island crew uncovers more of the structure, revealing the Roman numeral “III” and “IV” carved into another beam. “Is this searcher or depositor?” asks Jack Begley. “Trying to figure it out,” replies Craig Tester. In this episode, Rob Hyslop and Ryan Levangie of Azimuth Consulting Ltd. use LIDAR technology to create a three-dimensional map of the suspected 90-foot stone discovered in Season 6, Episode 7. In this procedure, they used a Trimble CX 3D scanner to shoot pulses of laser light at the stone and measure the speed and wavelengths of the light that reflected back to the device. Using the data from this survey, they created a 3D model of the stone, the findings from which have yet to be revealed. In this episode, Gary Drayton discovered a gold-plated, sediment encrusted coin in Smith’s Cove. The Lagina brothers observed that this object does not appear to bear the markings of a milled coin, which Drayton explained was an indication that the object, if it is indeed a coin, is probably very old. Until the mid-1500s, most European coins were hammered. In this procedure, blank metal discs were placed between two dies, the upper one bearing the image of the monarch under whose authority the coins were minted and the lower one anchored in a sturdy surface. That accomplished, the upper die was struck with a hammer, impressing both images into the coin. Coins struck in this manner could be easily “clipped”, clipping being the unscrupulous practice of shaving small portions of precious metal from the edge of the coin and then using the lighter coin as if it retained the same value as the original. In the mid-16th Century, various royal mints throughout Europe began to machine their coins rather than hammer them. By the end of the 1700s, mints around the world began using machines to “mill” or “reed” their coins, creating adornments along their edges in order to discourage clipping, as an absence of these adornments in milled coins instantly identified them as having been clipped, and therefore worth less than their face value. Since the coin found in Smith’s Cove does not appear to have been milled, it seems likely that it was struck prior to the late 1700s, when milled coins became the norm throughout much of the Western world.